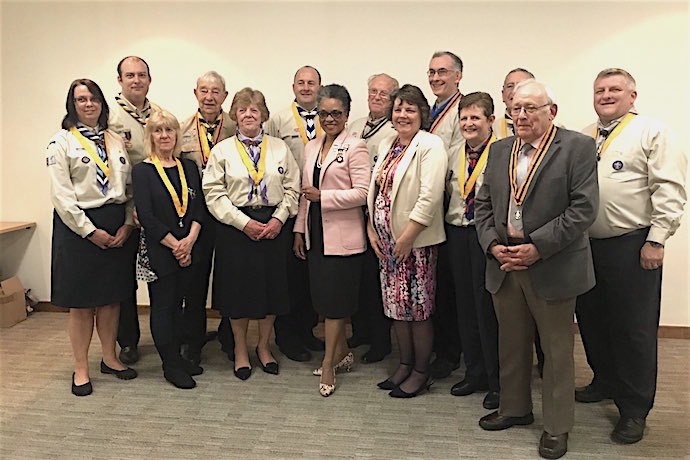 Thirteen adult volunteers were recognised in the annual Avon Scouts awards evening for their work in Scouting in the region. County Commissioner Graham Brant and Mrs Peaches Golding OBE, H M Lord-Lieutenant for Bristol presented medals awarded by Chief Scout Bear Grylls. 'There's more than 487 years of Scouting achieved among the award winners,' remarked Graham at the start of the awards. Awards for gallantry, meritious service and long-service were presented before an audience of over 50 Scouts and their family members. The Scouts honoured were drawn from South Bristol, Southmead, Congresbury, Kingswood, North Bristol and more areas of the City region. 'The many hours volunteering has helped young people find a direction, make life-long friendships, gain new skills, explore the out-of-doors and take part in international activities,' Peaches added. 'Our city is grateful for the dedication of these fine people and the tremendous impact they make on making our society stronger, wiser and ambitious.' Some of the recipients of the medals will attend a reception at Windsor Castle later this year. On Thursday 28th March Stephen Parsons MBE DL represented the Lord Lieutenant at a Citizenship Ceremony in the Old Council Chambers. In a simple but moving ceremony 36 citizens from 21 countries swore the oath of allegiance and became British Citizens. 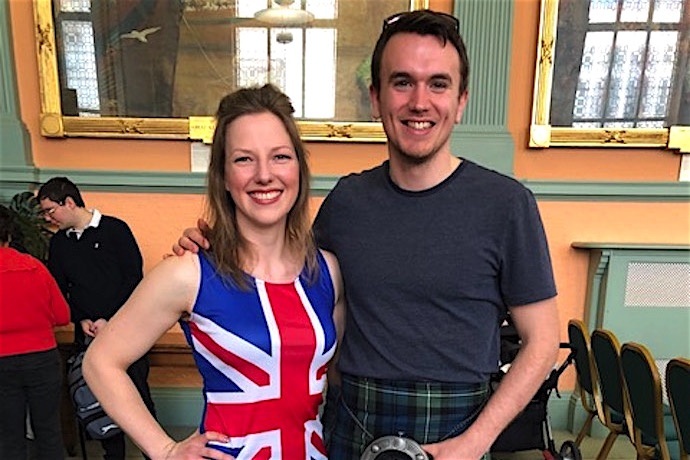 Amongst them was the Dutch girl pictured here in her Union Jack flag dress and her Scottish boyfriend. Now that’s commitment to your new country and well done to her! 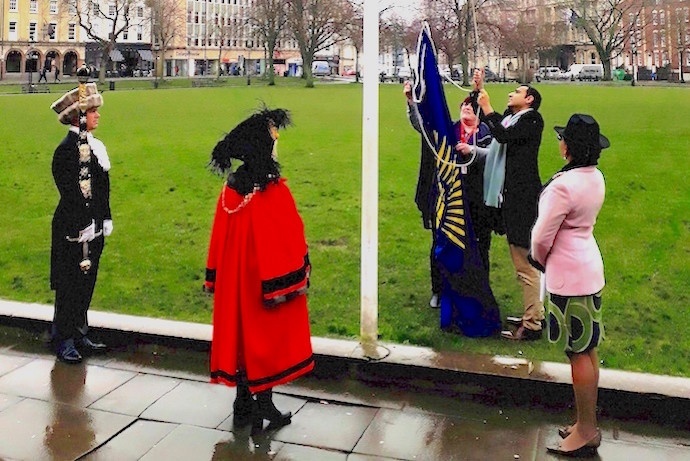 Civic dignitaries were joined by school children and members of the Bristol Commonwealth Society to raise the Commonwealth flag on College Green on Commonwealth Day. HM Lord-Lieutenant Mrs Peaches Golding read The Queen's message to the Commonwealth. This year marks the 70th anniversary of the London Declaration which marks the creation of the Commonwealth. Nations of the Commonwealth join together as free and equal countries united by history and propelled forward with the hope of finding ways to protect our planet and people. Despite the many changes since its foundation, the Commonwealth demonstrates how the network's values of cooperation and mutual support endure over generations. The Lord Mayor Cllr Cleo Lake read out the Affirmation, itself followed by a response read by everyone gathered together. Canon Michael Roden offered a prayer and blessing. 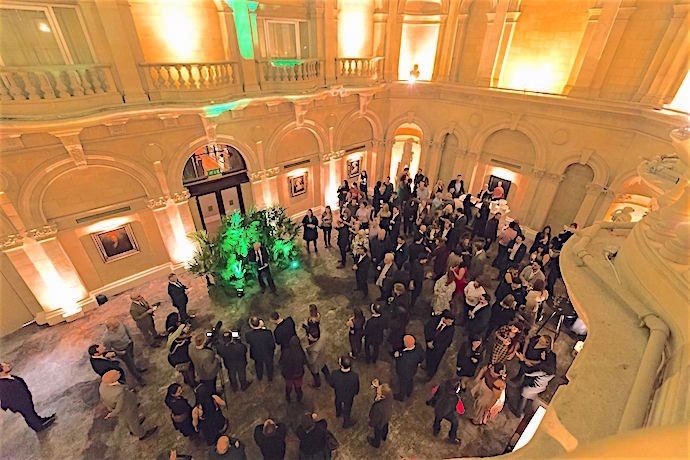 The Palm Court of the Bristol Marriott Royal Hotel was the arrival destination for guests marking the relaunch of the Hotel just three weeks before its 150th anniversary. The extensively restored Marriott Royal Hotel played host to HM Lord-Lieutenant Mrs Peaches Golding and Lord Mayor Cllr Cleo Lake and guests drawn from a wide range of local businesses. Mr Ronny Maier, Market Vice President UK Provinces and Scotland, welcomed the guests and encouraged them to explore the beautifully renovated Miller and Carter Restaurant, Drawing Room and the bar. Guests were treated with delicious canapés and an assortment of beverages in the Palm Court and in the bar. Girl Guides from the Bristol and South Gloucestershire County celebrated Thinking Day with a review of recent activities across the region. Chief Commissioner Carole Pennington and Deputy Chief Commissioner Liz Brown led the event held at the ss Great Britain. Videos of the Girl Guides showed how they learned and practiced a range of skills at international jamborees as far afield as Kenya and Nepal and perfected engineering skills aboard HMS Raleigh. A new programme for young women aged between 18 and 30 was also launched. 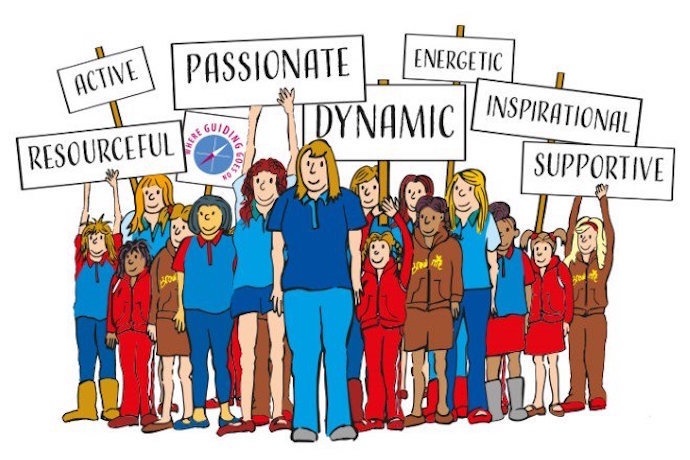 More girls wish to join Girl Guiding than there are spaces available due to a lack of adult volunteers to lead the work in the region. Among guests at the reception were H M Lord-Lieutenant Mrs Peaches Golding OBE, Deputy Lord Mayor Mrs Lesley Alexander, Deputy Lieutenants Mrs Jo Chambers and Mrs Susan Davies as well as Councillors from South Gloucestershire. A key aspect of Common Purpose’s Meridian programme is the development of effective leadership skills among senior managers whose working environments involve complex partnerships across public and private sector organisations. Held at the Bristol Old Vic, H M Lord-Lieutenant Mrs Peaches Golding OBE addressed participants on her experience of authority and leadership. An area of authority raised by Mrs Golding that interested many of the senior leaders was that of authority by disruption. In today's fast-moving business or social environments, being fleet of foot, flexible or adaptable may mean that great leaders must harness disruption for the benefit of their organisations. In response to a number of questions, she discussed a mixture of skills senior leaders and their advisory or trustee boards can develop to improve their opportunities for success. Her Majesty Queen Elizabeth generously loaned, from The Royal Collection Trust, 144 drawings by Leonardo da Vinci to 12 museums across the England, Scotland, Wales and Northern Ireland, including the Bristol Museum and Art Gallery. At the Queen's request, HM Lord-Lieutenant Mrs Peaches Golding OBE participated in the launch of the exhibition in Bristol. Similar events occurred simultaneously at each of the other 11 locations - the most ambitious launch of an art exhibition ever carried out. Peaches Golding introduced the scope of the exhibition and prefaced a video featuring HRH The Prince of Wales who is Chairman of the Royal Collection Trust. There were contributions from Jon Finch, Head of Culture for Bristol Museum, and a representative from The Royal Collection Trust. The 12 drawings on display in Bristol demonstrate the breadth of works by da Vinci, ranging from landscapes and anatomical drawings to botanical drawings and some engineering fantasies too. The exhibition marks 500 years since the death of the great artist. 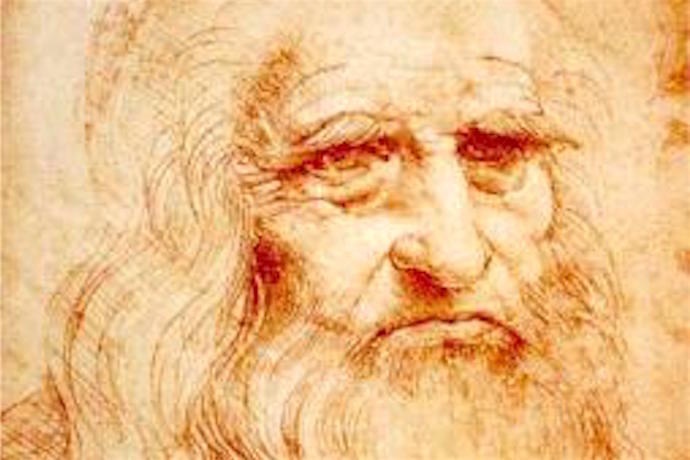 The City has unprecedented access to the da Vinci drawings until 6 May 2019. A warm welcome for Canon Chancellor Michael Roden! Reverend Michael Roden was installed as Canon Chancellor of Bristol Cathedral in a beautiful Choral Evensong led by the Bishop of Bristol Viv Faull. The Letters Patent of HM The Queen, prepared by the Lord High Chancellor of Great Britain, were read out by HM Lord-Lieutenant Mrs Peaches Golding OBE. 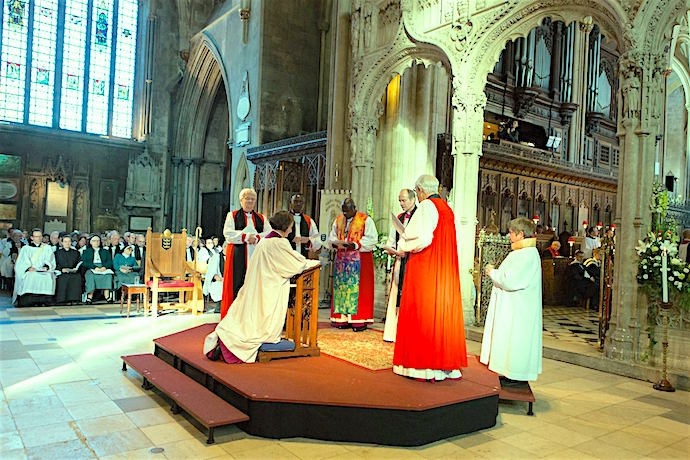 The document, together with readings from the Old and New Testament and hymns, formed an essential part of the installation of Rev’d Michael Roden to the Canonary Residentiary of Bristol Cathedral. The Cathedral Choir, conducted by Mark Lee with organist Paul Walton, sang during the service. Among the prayers said for the new Canon was the hope that Canon Roden’s ministry ‘may find power, peace and gladness, and share the same with those whom he serves.’ We extend a warm welcome to Canon Roden. Nearly 100 parishioners from his former post in Hitchin, Herts attended the service to wish the Canon well in this new role. 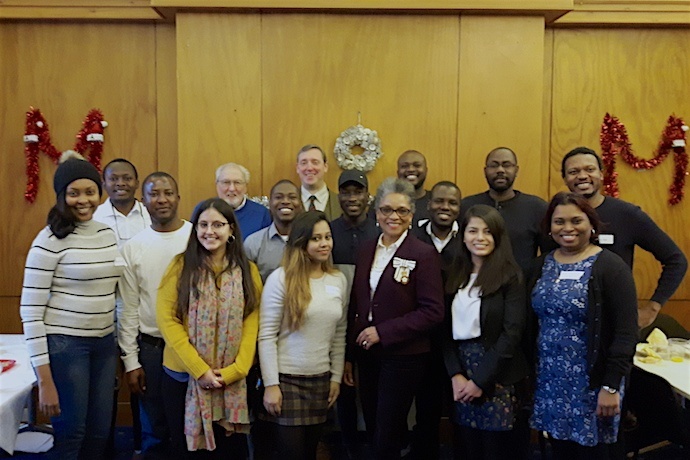 Commonwealth scholars studying in the Southwest of England from Africa, India and the Caribbean welcomed in the New Year with a networking lunch reception at the Bristol Commonwealth Society. Their interests ranged from education and aerospace engineering to climate change and communications. Bristol Commonwealth Society Treasurer Mr Nicholas Ball opened the reception by telling the students that the Commonwealth Society raises awareness of the 52 Commonwealth countries, supports young people that want to know about what the Commonwealth has to offer in the present and future and promotes trade between countries in the Commonwealth. Mrs Peaches Golding OBE, HM Lord-Lieutenant for Bristol, emphasised that the scholars were selected on the basis of their talent, skills and innovation and that the Bristol Commonwealth Society would enable them to make global networks that would benefit them, their home countries and the world. Given the fast-paced, global nature of the today’s society, she encouraged them to make the best use of this opportunity to establish life-long connections, whether for work or pleasure. The scholars present are attending university in Bristol, Bath and Bournemouth and come from India, Nigeria, Ghana, Kenya, Zambia, South Africa and Jamaica. I am delighted to introduce you to my 2018 to 2019 Lord-Lieutenant’s Cadets. From left to right, they are Leading Cadet Asa Schuman of Avon District Sea Cadet Corps, Cadet Sergeant Lewis Leppier from Bristol Army Cadet Force, Cadet Warrant Officer Charlotte Moss of Bristol and Gloucestershire Wing Air Training Corps and Cadet Warrant Officer James Tovey from Colston’s School Combined Cadet Force. Each of the Cadets will be able to wear the prestigious Lord-Lieutenant’s Cadet badge denoting their status. They also receive a framed certificate signed by the Lord-Lieutenant marking their appointment. The Lord-Lieutenant’s Cadets perform an interesting role, accompanying the Lord-Lieutenant on duties such as royal visits, Remembrance Sunday and other occasions. Each has been selected on the basis of their application to cadet force activities and opportunities, their personal characteristics and drive. 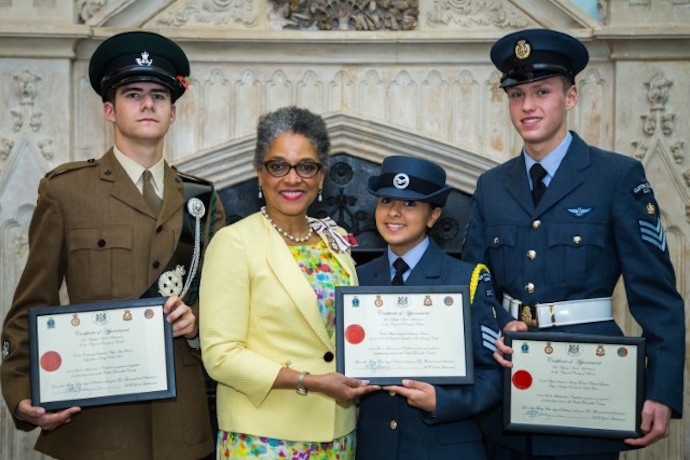 ’To be appointed as a Lord-Lieutenant’s Cadet, these young people have undergone a rigorous assessment process involving both their cadet force leaders and the Wessex Reserve Force and Cadet Association,’ explained Mrs Peaches Golding OBE, Lord-Lieutenant for Bristol. ‘I thoroughly enjoy widening the horizons of the Cadets by giving them a glimpse into a wider social and community role than most young people of their age encounter.’ The Cadets were appointed in October 2018. The hillside on which the graves of soldiers that served in World War I, known as Soldiers Corner, was rededicated following an extensive restoration project at the Arnos Vale Cemetery. 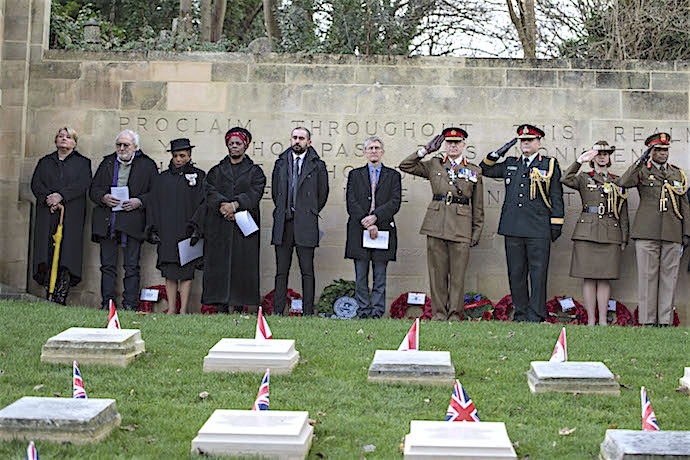 Soldiers from Bristol, South Africa, Canada and Australia are buried here and representatives from their military services took part in the poignant service organised by the Commonwealth War Graves Commission. The service was opened by Nigel Dyke, Chairman of the Arnos Vale Cemetery Trust. The Lord-Lieutenant Mrs Peaches Golding OBE read a poem written just days before the author fell during the battles of the Somme. Readings by officers representing the national military forces attending today's service preceded the laying of wreaths. 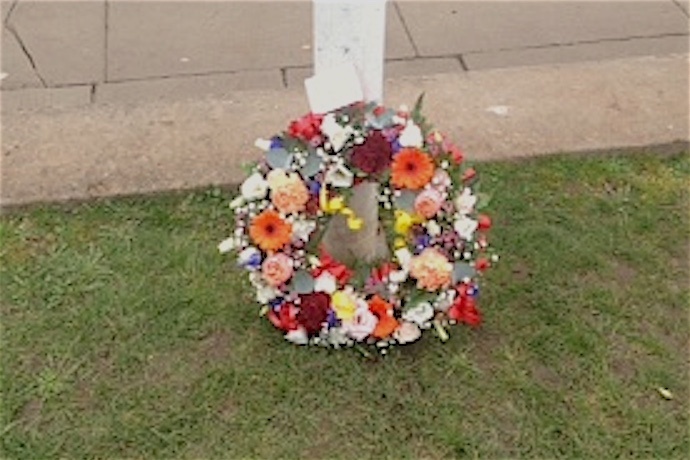 Among those laying wreaths were Peaches Golding, Deputy Mayors Cllr Asher Craig and Cllr Craig Cheney, Mrs Joyce Smith MBE (who was elevated for her role in the restoration work on Soldiers Corner) and the Commonwealth War Graves Commission, among others. Members of the Walker Family and Napier Family joined the Royal Marines and 1st Rifles in laying flowers on graves of special significance to each of them. The National Anthems of South Africa, Canada, Australia and the United Kingdom were song at the end of the service. The photograph was taken by the Commonwealth War Graves Commission. Guests from the Romanian community, dignitaries and friends gathered to celebrate the 100th anniversary of Romanian National Day. 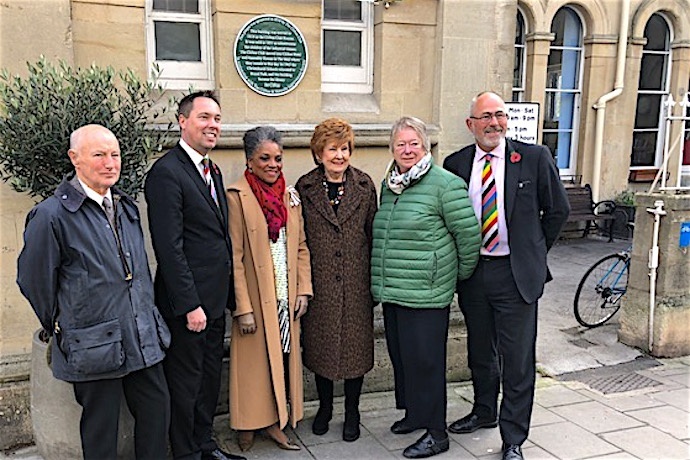 Among the dignitaries were Lord-Lieutenant Mrs Peaches Golding OBE, High Sheriff Roger Opie, Bristol Lord Mayor Cllr Cleo Lake as well as the Romanian Ambassador Mr Dan Mihalache. The celebration, organised by Honorary Consul General Mr Razvan Constantinescu, included speeches from the Lord-Lieutenant and Ambassador, the singing of traditional songs, a banquet of traditional foods and a beautifully decorated cake. ‘When Transylvania was united with Romania, the country welcomed everyone into an inclusive society, regardless of religion or nationality’ remarked Peaches Golding. ’This ideal is held firmly to this day.’ The cutting of the cake by the Ambassador and Lord-Lieutenant initiated the singing of more songs during a very enjoyable evening. Nine categories of award were made at the third annual Recognising Success Awards of University Hospitals Bristol. The awards, generously supported by charity Above and Beyond, celebrated the care and commitment of staff and volunteers from around the Trust. This year 262 nominations about the work of individuals, teams and volunteers were submitted. Staff working in clinical and non-clinical areas were all recognised. The awards provide the perfect opportunity to celebrate and acknowledge the achievements of individuals and teams from all different areas and division. The awards were opened by Paul Kearney, Chief Executive of Above and Beyond and Jeff Farrar, Trust Chairman. 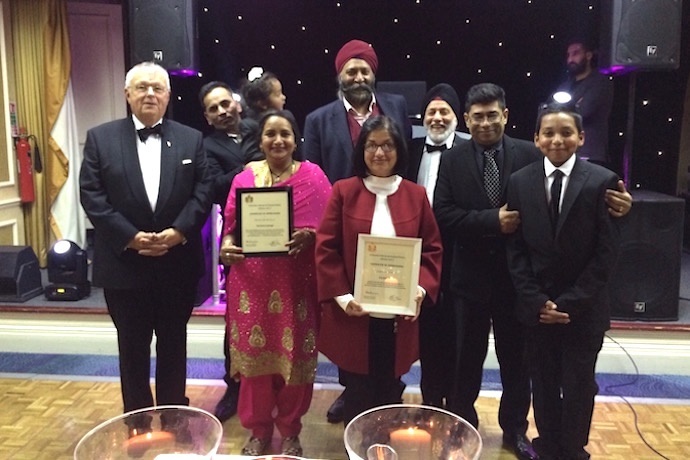 Lord-Lieutenant Peaches Golding OBE presented the Volunteer of the Year award to Catherine Nanji. Other winners included Clare Bidgood for the Transforming Care Award; Mat Molyneaux for Patient Safety Champion; Caroline Haines for Excellence in Teaching, Learning or Research; Sophie Williams for Inspirational Leader; Martyn Carter as Unsung Hero; Sarah Harper for Patient Experience Champion; Sterile Services as Non-Clinical Team of the Year, and Ward 11 Nursing Team for Clinical Team of the Year Award. In a solemn ceremony at the Cenotaph watched by some of the largest crowds in recent years, wreaths were laid to honour the memory of the fallen and those who fought in conflicts from World War One to the present day. Two minute’s silence was observed at 11.00am, precisely 100 years since the sounds of guns and mortars fell silent across the battlefields of the Western Front. 6,000,000 UK troops were mobilised during the conflict. Some 55,000 people from Bristol fought in the war effort, with 7,000 having left the city never to return again. Eight Bristolians were awarded the Victoria Cross for their bravery. While the armistice marked the end of fighting, it took six months to negotiate the peace treaty that finally ended the war and enabled the soldiers to return to the UK. 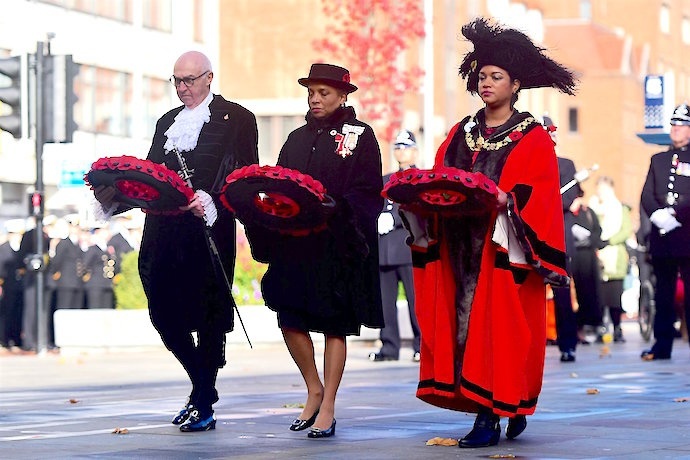 High Sheriff Mr Roger Opie, HM Lord-Lieutenant Mrs Peaches Golding OBE and The Lord Mayor Ms Cleo Lake prepare to place the first wreaths at the Cenotaph, followed by the elected mayors and Police and Crime Commissioner, members of Parliament, Councillors and Aldermen, members of the Armed Forces, among others. In a solemn ceremony at the Cenotaph watched by some of the largest crowds in recent years, wreaths were laid to honour the memory of the fallen and those who fought in conflicts from World War One to the present day. Two minute’s silence was observed at 11.00am, precisely 100 years since the sounds of guns and mortars fell silent across the battlefields of the Western Front. 6,000,000 UK troops were mobilised during the conflict. Some 55,000 people from Bristol fought in the war effort, with 7,000 having left the city never to return again. Eight Bristolians were awarded the Victoria Cross for their bravery. While the armistice marked the end of fighting, it took six months to negotiate the peace treaty that finally ended the war and enabled the soldiers to return to the UK. High Sheriff Mr Roger Opie, HM Lord-Lieutenant Mrs Peaches Golding OBE and The Lord Mayor Ms Cleo Lake prepare to place the first wreaths at the Cenotaph, followed by the elected mayors and Police and Crime Commissioner, members of Parliament, Councillors and Aldermen, members of the Armed Forces, among others. “This building was erected in 1818 as the Clifton Club Rooms. It was sold in 1851 as schoolrooms for children of the industrial classes. The Clifton Club moved into Clifton Hotel and Assembly Rooms in The Mall where they remain to this day. In 1965 the Christchurch Schools relocated to Royal Park, and this building became the library for Clifton. 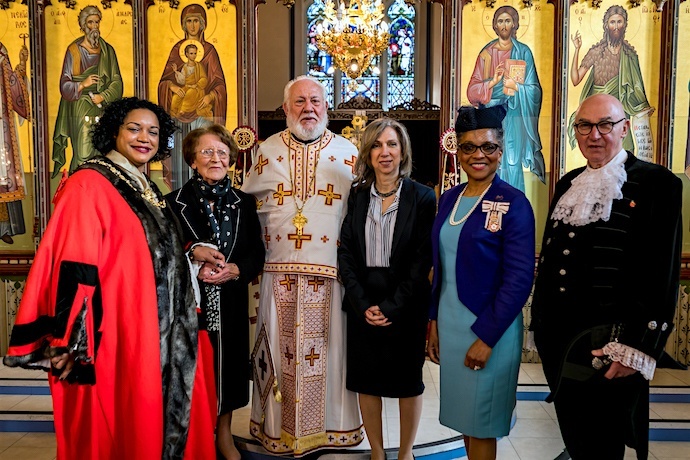 The congregation of the Greek Orthodox Church of Saints Peter & Paul in Easton remembered ‘OXI’ Day in the presence of the Lord-Lieutenant of Bristol Mrs Peaches Golding OBE, the High Sheriff Mr Roger Opie, Lord Mayor Cllr Ms Cleo Lake and President of the House of Representatives of the Republic of Cyprus, Mr Dimitrios Syllouris. The Remembrance Day service was led by the Very Reverend f. George Nicolaou. The Divine Liturgy was read in both Ancient and Modern Greek and the fallen were remembered. Around 70 children and young people from the Greek community recited poems and other readings learned in the school funded by the Embassy of Greece and members of the community whose works helped the community in the past were honoured. The good works of Mrs Aglaia Hill, the founder of the Greek Community and pictured second left, were recognised. On this day in 1940, the Prime Minister Ioannis Metaxas said “No”, or OXI, to an ultimatum made by Italian Prime Minister Benito Mussolini to allow Italian forces to occupy strategic locations in Greece or otherwise face war. Mussolini expected to be able to easily defeat the Greeks and impress Hitler. Instead the Italians were defeated and the Greeks went on to fight in Egypt and other Mediterranean locations. 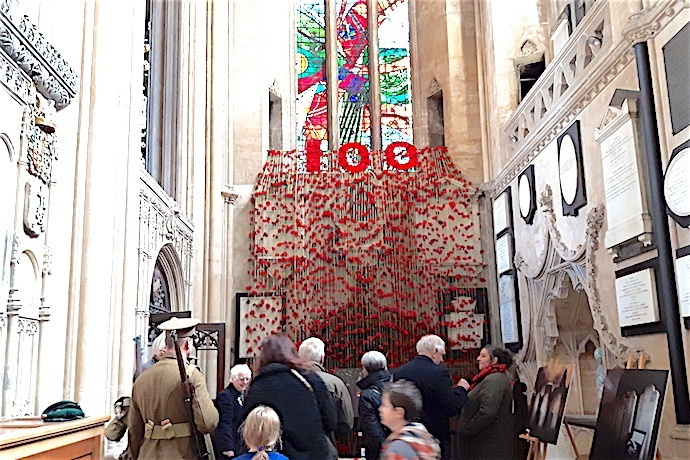 A wreath and a cascade of hand-knit poppies were placed in Bristol Cathedral to commemorate 100 years since the end of World War One, part of the remembrance events planned by the Royal British Legion. The launch of the poppy appeal took place at College Green where a stirring recreation of a scene from World War One marked the start of a special fortnight of remembrance of the centenary of the end of the Great War. 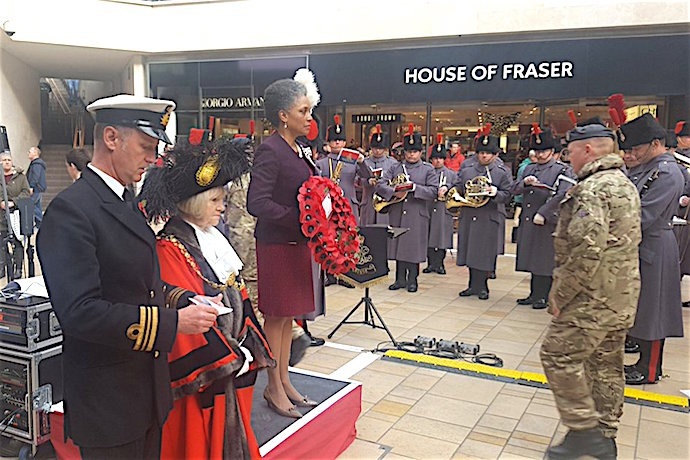 The Bristol Military Wives Choir and representatives from the Bugler’s Association of the Light Division and Rifles participated in the event alongside HM Lord-Lieutenant Mrs Peaches Golding OBE, High Sheriff Roger Opie and Lord Mayor Ms Cleo Lake. On College Green, 1,000 waterproof poppies created a beautiful and poignant display on which the public could inscribe their own message of gratitude or remembrance. Other events taking place in addition to the Remembrance Sunday wreath-laying are the Festival of Remembrance on Saturday 10th November and the lone-piper’s lament at 6.00am on Remembrance Sunday. Last year, more than £580,000 was raised by residents in Bristol and South Gloucestershire to the benefit of veterans and service families in the area. The Royal British Legion is the national custodian of Remembrance. Beavers, Cubs and Scouts of the 69th Bristol (St Joseph’s) Scout Group invited Lord-Lieutenant Mrs Peaches Golding OBE to celebrate their 60th anniversary with them at St Joseph’s Church Hall in Fishponds. Mrs Golding enjoyed meeting the young people and learning more about the skills they are perfecting. She was involved in knot tying and sampled the cheesy pasta cooked on the ‘campfire’. In a competition to see who could open and reassemble their mess kit the fastest, Mrs Golding came a reasonable fourth, soundly beaten by the Scout who taught her how to do it! One of the Scouts demonstrated how they used a drill to make a noughts and cross game which, over the course of several meetings, was sanded then painted. She played several rounds of noughts and crosses with one of the Scouts. Scout Leader Marek Petela informed Mrs Golding of the numerous trophies the Group won over the many years of its operation. Then she happily joined in songs around the campfire led by Mrs Petela. Best of all, after making a brief speech to congratulate the Group and its adult volunteers, Mrs Golding made the first slice on a giant, home-made chocolate cake and encouraged everyone to join her in eating it. The Second Sea Lord, Vice Admiral Tony Radakin CB, hosted a dinner for affiliates of HMS PRINCE OF WALES at Admiralty House and aboard HMS VICTORY, the flagship of Admiral Lord Nelson. 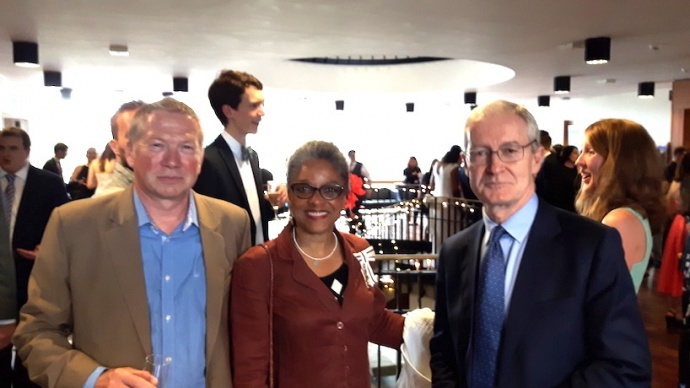 Lord-Lieutenant for Bristol Mrs Peaches Golding OBE and Mr James Durie from the West of England Initiative of Business West were among the guests. Other guests included Lord-Lieutenant for Merseyside Mark Blundell (representing Liverpool), representatives from Greenwich Hospital Trust and the Goldsmiths’ Livery Company as well as Brigadier Graeme Fraser RM (Naval Regional Commander for Wales and Western England). Dinner was served in Admiral Lord Nelson’s cabin on the 213rd anniversary of his death at the Battle of Trafalgar. Despite being mortally wounded Nelson lived long enough to learn that, due to his instructions of how to fight the battle, England defeated the French fleet and established England’s legacy as a naval power. HMS VICTORY is the flagship of the First Sea Lord and, as a national monument, is a major tourist attraction in Portsmouth. Around 700 guests, including community and faith leaders and representatives from charities and the arts, attended the service. Among those attending was the Lord-Lieutenant of Bristol, the Archbishop of York, the Lord Mayor of Bristol, the High Sheriffs of Bristol and Wiltshire, and the Deputy Lord-Lieutenant of Somerset, the Deputy Lord-Lieutenant of Wiltshire and the Lord-Lieutenant of Gloucestershire. The Order of St John combined forces with the National Health Service for Blood and Transplant to honour the families of people that have given life and hope to others through organ donation with an afternoon tea and awards presentation. There are currently about 3 people dying every day due to the shortage of organs and there are about 6,400 people, young and old, on the transplant waiting list. The ceremony was attended by more than 30 families who, in the moments of immense grief, generously gave their organs to unknown individuals. County Chairman Simon Darwall-Smith (pictured on the right of the exhibition panel) and HM Lord-Lieutenant Mrs Peaches Golding OBE presented the award memento which features the organ donation heart logo, backed by the Maltese Cross of the Order of St John above the words “Add life, give hope” and a certificate from the Grand Prior of the Order of St John, His Royal Highness the Duke of Gloucester. Members of the NHS Blood and Transplant shown here in blue uniforms helped each of the families as they made their decisions on behalf of their loved ones. Those in green uniforms are staff from the St John Ambulance Service. The Order of St John is a Royal Charity and can trace its roots back over 900 years. It is the parent of St John Ambulance, the nation’s leading first aid charity which voluntarily delivers 16 million hours a year of first aid, care, education and training in the community. 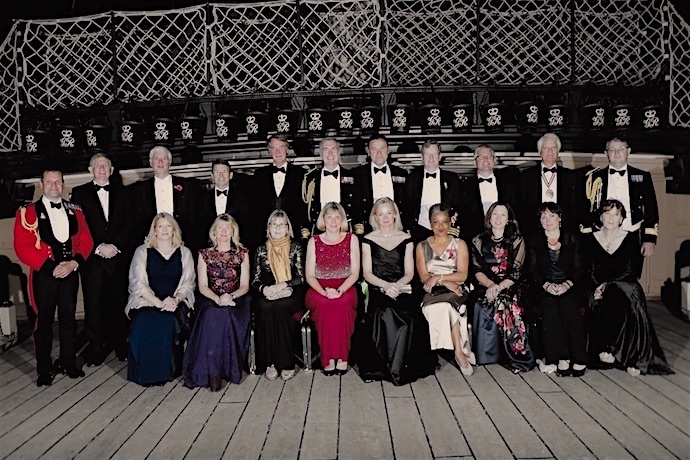 Nigel Fletcher, President of the Bristol Steamship Owners’ Association (left in picture), presided over its 87th annual dinner aboard the ss Great Britain. He announced several important initiatives, including joining with other trade organisations to form a Maritime Trade Cluster. Keynote speaker Tim Bowles, West of England Mayor (second from left) outlined how the maritime sector will play a greater role in the plans of the West of England Combined Authority in his keynote address. 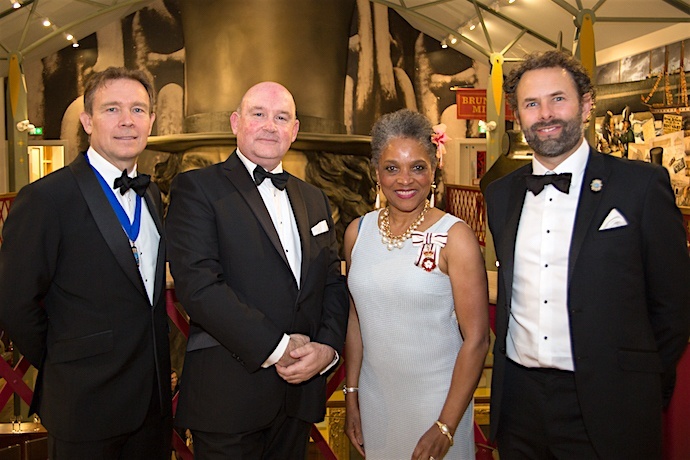 Lord-Lieutenant Mrs Peaches Golding OBE attended the Dinner and remarked ‘Bristol is a maritime city and has always boasted skilled craftspeople and a healthy supply chain for the maritime sector.’ John O’Connor, Vice President of the Bristol Steamship Owners’ Association (far right). Mr Fletcher also announced that the Bristol Steamship Owners’ Association, established 111 years ago, will now be called the Bristol Maritime Trade Association. The Planetarium at We The Curious staged a 3-D journey around the solar system in recognition of the 100th anniversary of the performance of The Planets by Gustav Holst. 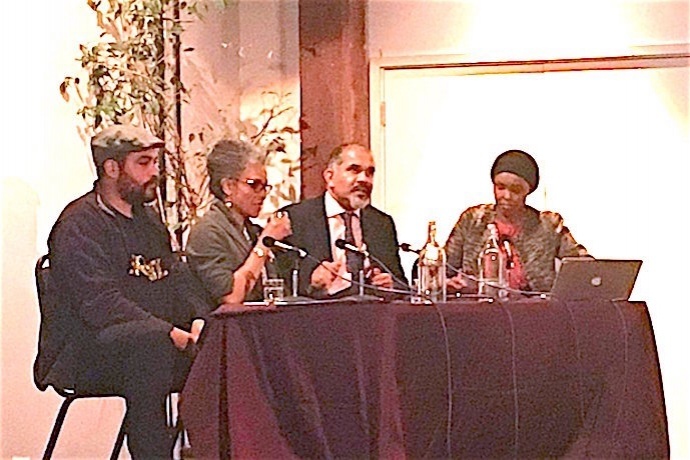 Lord-Lieutenant Mrs Peaches Golding OBE and Mr Bob Golding attended the performance as guests of Anna Starkey, Chief Creative Officer, and Donna Speed, Chief Operating Officer, of We The Curious. 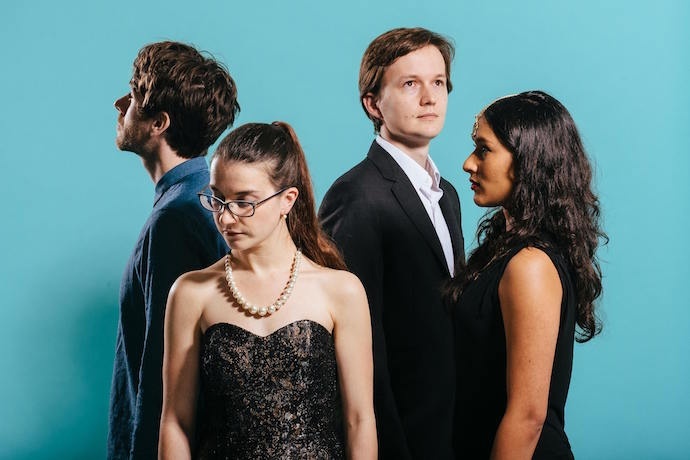 For one night only, the Ligeti Quartet performed eight contemporary classical pieces in honour of each planet accompanied by an amazing visual experience. 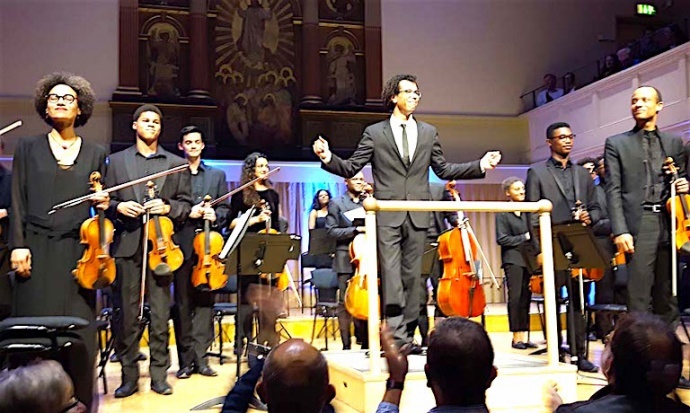 While the musicians serenaded the audience, close up images of the surface of each planet, graphic displays of the trajectory of its moons, images of Voyager II or the International Space Station informed and entertained the audience. Narrator Jon Culshaw provided astronomical information on each planet, together with his impression of scientists ranging from Professor Brian Cox and David Attenborough to Carl Sagan and more. Peaches Golding remarked that ‘until tonight, I had not realised that the planet Mercury and Saturn’s moon Titan are of similar sizes!’ Bob Golding, whose background is in the management of, and innovation in, visitor attractions, noted the enormous time put into developing the 3-D graphics that made the exploration of each planet come to life. Photo credit: Mike Massaro. 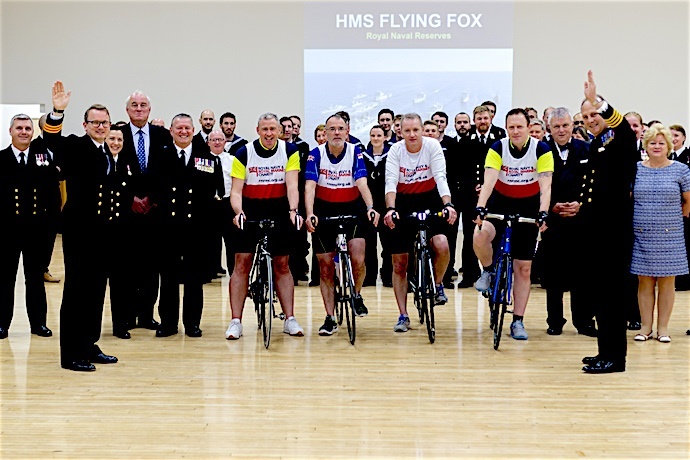 The Royal Navy Reserve (RNR) unit based in HMS FLYING FOX, Bristol, opened its doors to employers and local dignitaries to showcase the role that the unit and wider RNR play in supporting the Royal Navy. Members of the ships company demonstrated some of their capabilities and the training that they undertake. The Commanding Officer of HMS FLYING FOX, Surgeon Commander Richard Graham (pictured second left), praised the role of employers in supporting the work of the unit. “HMS Flying Fox is indebted to the employers and supporters of our reservists. Without their continued support, we would not be able to achieve our aim of providing suitably qualified and experienced personnel to the Royal Navy at times of national need in order to strengthen the defence of the UK. RN in the West is our opportunity to say thank you and explain what we do.” The highlight of the evening was a display of ceremonial excellence from the Band of Her Majesty’s Royal Marines and the Flying Fox Guard. A concert by pianist Christian Blackshaw and a quartet of soloists from the Berliner Philharmoniker marked the opening of the new extension to St George's Bristol. 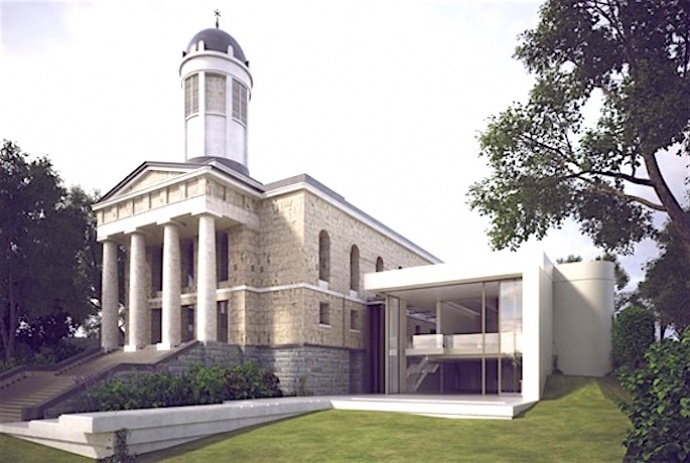 The spacious, ‘pavilion-style’ stone and glass extension to St George's concert hall creates a space for events, festivals and houses a café and bar with views into the gardens of the 19th century former Georgian church. At a pre-concert reception Suzanne Rolt, Chief Executive of St George’s Bristol, thanked supporters of St George’s Bristol for their dedication and ambition in securing the future of the hall. She told the assembled guests that the opening of the extension in one of the nation’s best-loved concert hall is the culmination of a seven-year plan costing £5.5m. 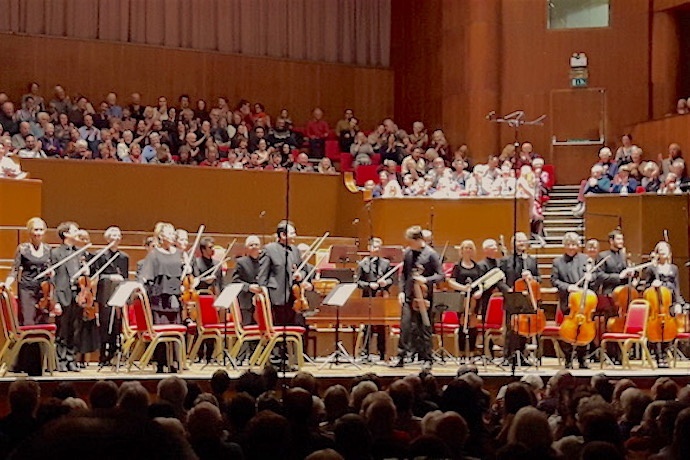 ‘I understand that the shoe box shape of the concert hall is responsible for the acoustic so enjoyed by classical, bass and world musicians,’ explained Lord-Lieutenant Mrs Peaches Golding OBE. The performance of piano quartets by Wolfgang Amadeus Mozart and a piano quintet by Franz Schubert thrilled the packed concern hall. TS Adventure Sea Cadets celebrate 80th birthday - hoorah! 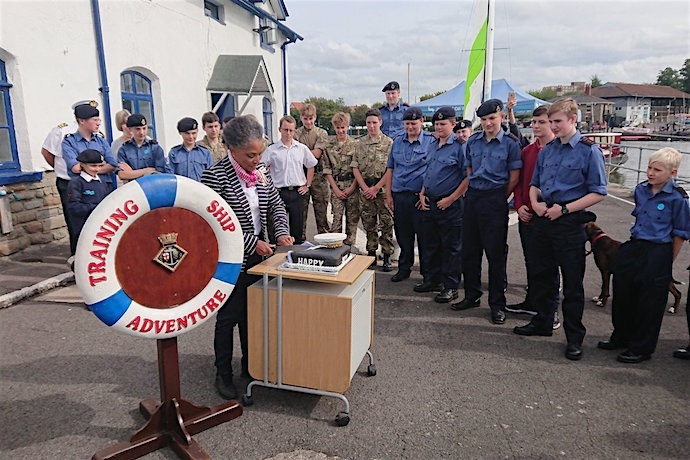 Bristol’s Lord-Lieutenant Mrs Peaches Golding OBE attended the open day at TS Adventure, the Sea Cadets home in the Cumberland Basin where Sea Cadets celebrated their 80th birthday. Mrs Golding was shown around the ship by two Sea Cadets, where she took part in tying knots, learned how to pack a bergen, observed how the Sea Cadets learn to plot a course at sea and so much more. ‘A quick trip on the water demonstrated that the Sea Cadets are putting into practice all the skills they are learning in safely operating power, sailing and rowing boats,’ Mrs Golding explained. A demonstration by the Sea Cadets of a physical exercise routine performed to music was a highlight of her visit. After tucking into a tasty barbecue, Mrs Golding cut the birthday cake which was baked and decorated by one of the Sea Cadets. Hoorah! 2442 Squadron (Air Training Corps) commemorated the Battle of Britain with dinner in the format of a conventional RAF Dining-in night. The Squadron’s sixteen Cadets began the evening by marching in the banner. During the dinner, the Cadets read poignant passages concerning significant events that took place during the Battle of Britain on 15 September 1940. The keynote speaker for the evening was Air Commodore Wendy Rothery, the Head of Accommodation within the Defence Infrastructure Organisation. Her illustrious career includes managing media activity across all joint overseas operational theatres, including those in Afghanistan in 2014. Her previous roles included Head of MOD Welfare and Head of RAF Recruiting and Selection. 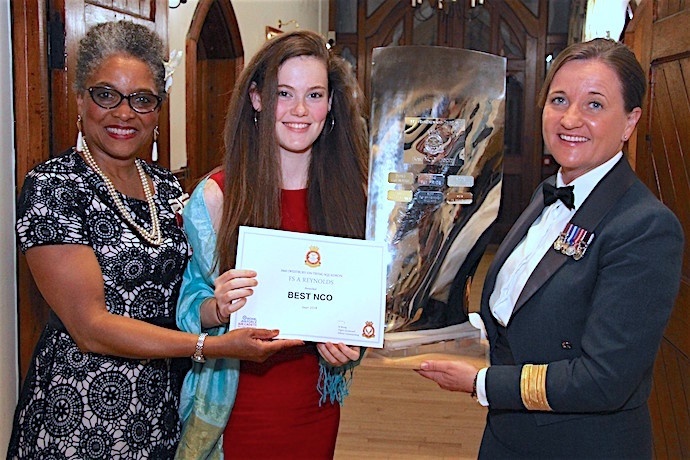 Outstanding Cadets were presented prizes by Lord-Lieutenant Mrs Peaches Golding OBE and Wendy Rothery, their citations being read by Flight Lieutenant Natalie Wong, 2442 Squadron commander. Cadet Flight Sargent Reynolds is pictured receiving the ‘Best NCO’ prize. Members of the Paediatric Gastroenterology Department at Bristol Children’s Hospital gathered together with colleagues from the South West, Wales, Birmingham, London, Southampton, Oxford and the Commonwealth to look at their achievements over the last 30 years since the Department was established by the then newly appointed Dr Bhupinder Sandhu; also to plan for the future. Among key contributors to the conference were Prof Jean Golding on her research with the Bristol Children of the 90s project and Dr Neelam Mohan who travelled from India to speak as President of the Commonwealth Association of Paediatric Gastroenterology and Nutrition. 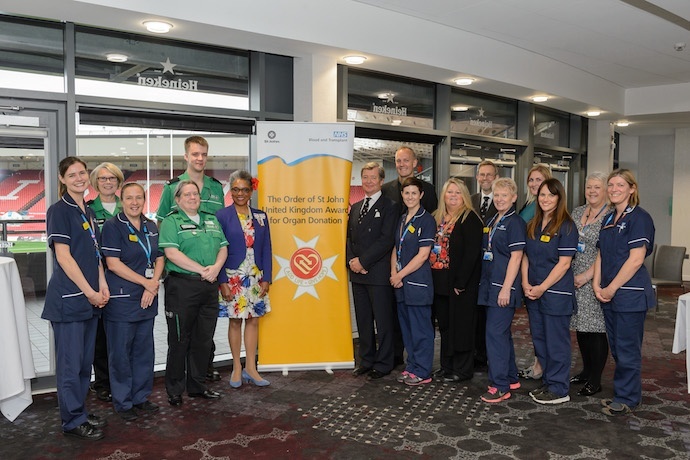 Special guests included Lord Lieutenant Mrs Peaches Golding OBE, Prof Jonathan Sandy (Dean of Bristol Medical School), Prof Deidre Kelly CBE (founder of the Paediatric Liver Unit in Birmingham) and Dr Christine Spray. 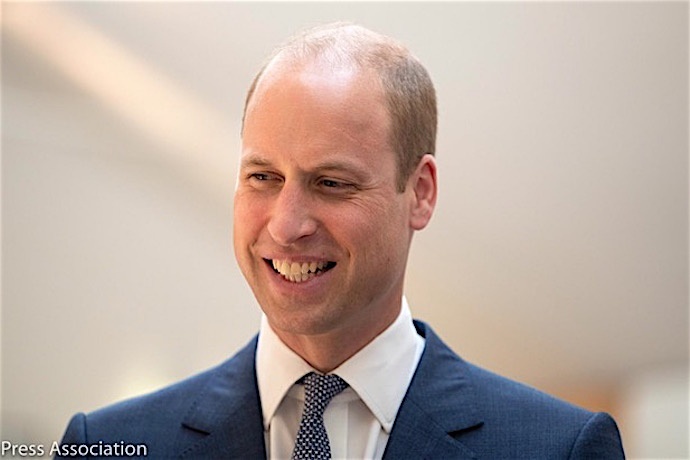 On the 11th of September HRH The Duke of Cambridge will launch ‘Mental Health at Work’, a national initiative of The Royal Foundation. The Royal Foundation is the primary philanthropic and charitable vehicle for The Duke and Duchess of Cambridge and The Duke and Duchess of Sussex. The aim of the initiative is to help remove the stigma around mental health. ‘Mental Health at Work' is a new online gateway that will change the way in which we approach workplace mental health across the UK. To see further comment and photographs of the launch on the 11th of September, click on BRISTOL AND THE ROYAL FAMILY above, then scroll down to the 11th September. Lord-Lieutenant, Mrs Peaches Golding OBE, officially opened the new office block at the Lawrence Weston Community Farm. 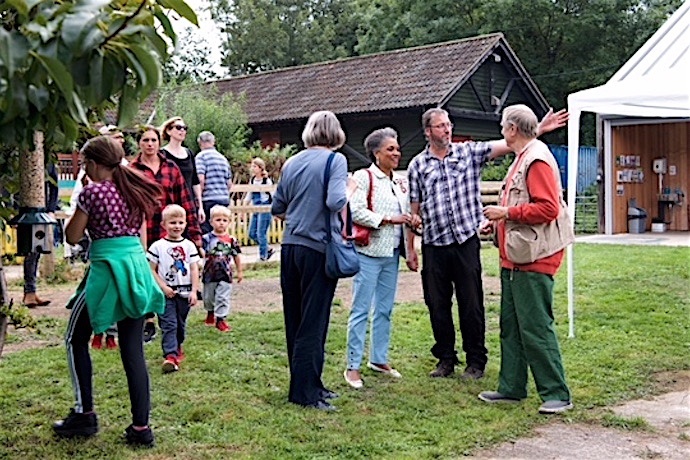 The occasion was attended by a crowd of local residents and friends of the farm. ’Lawrence Weston Community Farm provides the perfect location for local people to learn more about the lives of farm animals and how to grow edible plants. It has magical places for young people to build dens, climb tree stumps, swing around or just relax,’ explains Peaches. A former volunteer at the Community Farm, Peaches was accompanied on her visit by Robin Hicks, Trustee and Farm Advisor for the Lawrence Weston Community Farm. She was introduced to the new piglets, saw the chickens and goats and noticed what a bumper crop of fruit was ripening on the fruit trees. Along the way, she was able to meet many local people for whom the Community Farm provides a place to learn new skills or to de-stress. She officially opened the new office block which replaces the one damaged by arson last year. (Photo by Bob Pitchford). The Royal British Legion organised a moving ceremony held at the Menin Gate, Ieper, Belgium to remember and reflect on the sacrifices made by many soldiers from across the Commonwealth. The date marked the beginning of the last 100 days of World War I and the important battles fought in the battlefields of France and Flanders that eventually led to the end of the War in November 1918. A united force of British, Commonwealth, French and American forces using cavalry, foot soldiers, tanks and aircraft made a decisive push through enemy lines. The poignant commemorative service featured standard bearers from more than 1,000 Royal British Legion branches and the laying of more that 1,000 wreaths. Among the readings were letters from the fallen, facts regarding the importance of Commonwealth troops for the success of the Allies and poems. Lord-Lieutenant Mrs Peaches Golding OBE was a guest of the Bristol branch of the Royal British Legion. Dignitaries taking part in the service were HM Ambassador to Belgium Mrs Alison Rose, Ambassador of Pakistan the EU, Ambassador of Bangladesh to the EU, the Attaché of the German Embassy, Australian Attaché to Belgium, Mayor of Ypres, The Most Rev’d Dr John Sentamu (Archbishop of York), National Chairman of the Royal British Legion and Chairman of the Royal British Legion of Scotland along with the Director General of the Commonwealth War Graves Commission. 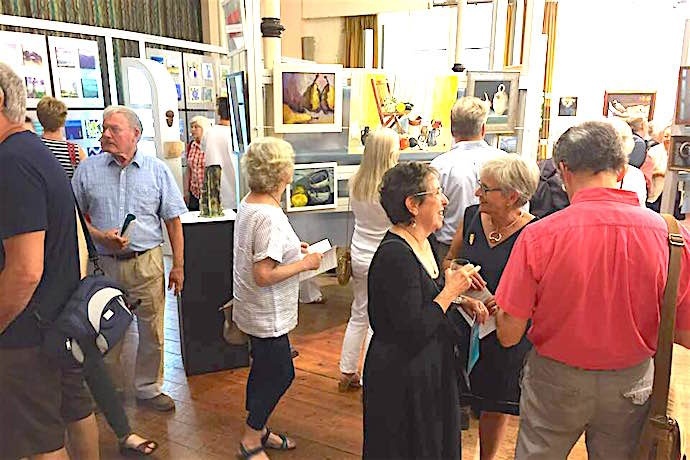 340 works of art were on display at the 109th Annual Clifton Arts Club exhibition held in the Undercroft of Victoria Methodist Church, Whiteladies Road, Clifton. The exhibition featured paintings as well as the work of potters, sculptors in wood and stone, and producers of works in enamels, metal or glass. 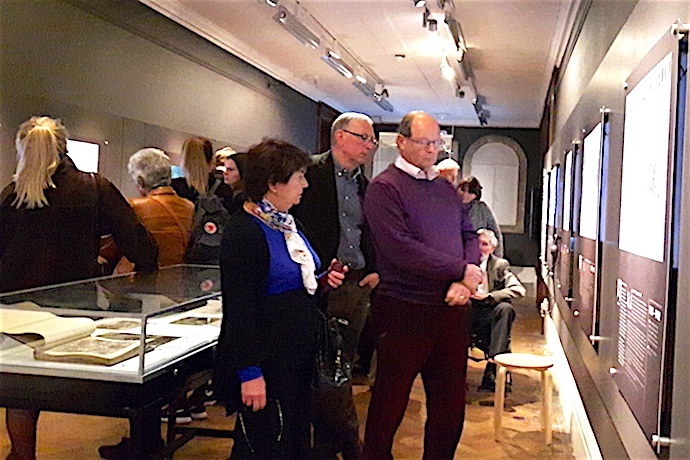 Mr Ian Barnes, Chairman of the Club, escorted Mrs Peaches Golding OBE, Lord-Lieutenant for Bristol round the exhibition to view art displayed. Peaches observed that 'members of the Arts Club encourage people to develop as artists. We are fortunate as a City to have so many volunteers that are willing to give of their time to help hang works of art and staff the two week exhibition. 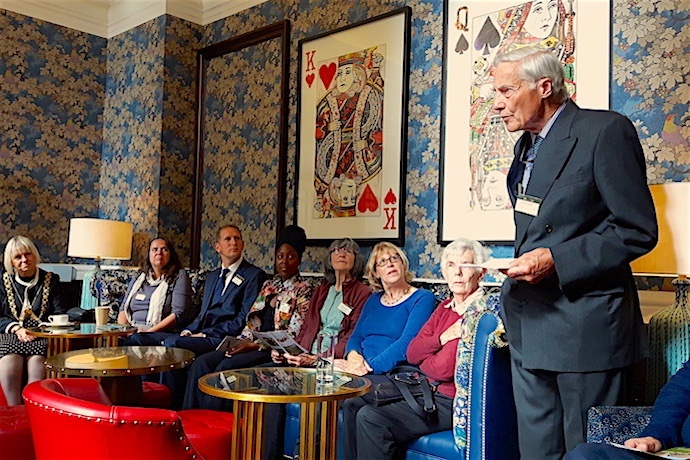 Everyone whose works have been displayed are to be congratulated.’ There are more than 200 members of the Clifton Arts Club, including many distinguished and experienced artists. Over 600 works of art by professionals and amateurs were submitted to the selection panel for this year’s exhibition. Photograph taken by Stuart Nurse. Over 100 of Bristol’s dignitaries and leading business people gathered on board the ss Great Britain for Womble Bond Dickinson’s Business Leaders Dinner. Before assembling in the First Class Dining Saloon, the Lord Lieutenant, Mrs Peaches Golding OBE, joined the Lord Mayor, Cllr Mrs Lesley Alexander, and the Metro Mayor, Tim Bowles, in the newly opened Being Brunel Museum. The Museum is full of artefacts and memorabilia belonging to, or associated with, Isambard Kingdom Brunel. Julian Kinsey, Partner and Head of the Bristol office of Womble Bond Dickinson, welcomed guests to the Business Leader Dinner and announced that the firm is celebrating its 20th year of Bristol-based operations. He also welcomed from the US office of Womble Bond Dickinson his fellow Partner and corporate lawyer, Christopher Gyves. 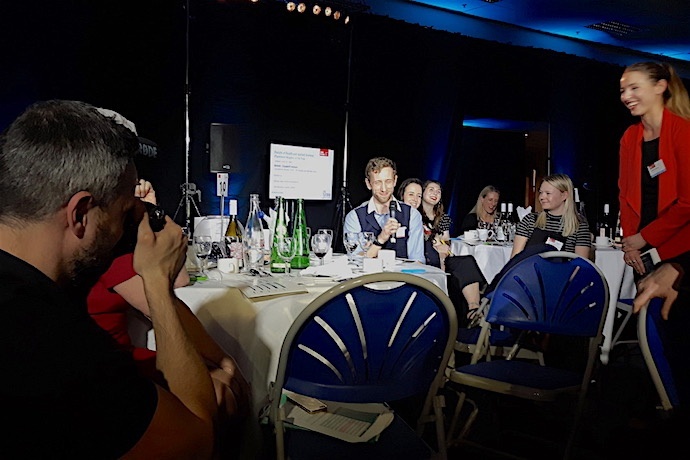 James Shone, founder of the charity 'I Can & I Am', spoke movingly on how adversity enabled him to re-evaluate how to find and negotiate future opportunities. James Woudhuysen, Visiting Professor of Forecasting and Innovation at London South Bank University, spoke on the unbelievable opportunities in the future and how Bristol is well-placed to lead in several significant market subsegments as diverse as robotics, nuclear energy generation and housing. The Royal Navy turned out in force at the launch of the affiliation between Bristol and HMS PRINCE OF WALES, Britain’s largest and newest aircraft carrier. 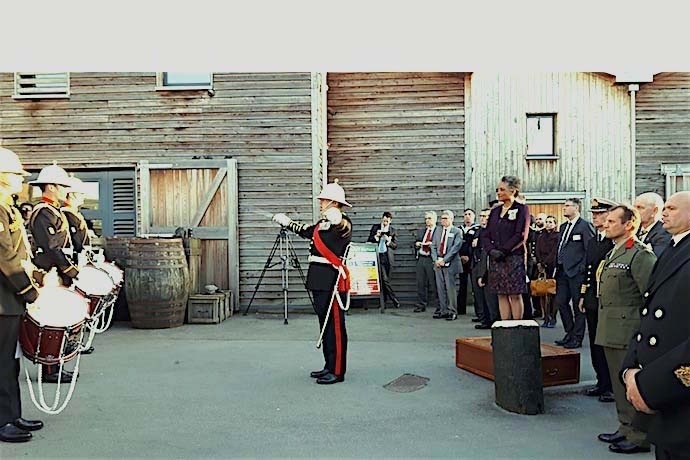 More than 100 business and community leaders were enthused by the prospects of the affiliation and were entertained by the sunset salute performed to high musical and professional standards by the Royal Marines Band. ‘While HMS PRINCE OF WALES will provide national security, display soft power and assist in international disasters, she will also host world leaders, diplomats, senior officials and more on board in the Bristol Suite - a space that reflects the 50 year relationship our city will have with ship’s company stationed on this amazing ship,’ explained Lord-Lieutenant Mrs Peaches Golding OBE. A presentation by Royal Naval Captain Groom highlighted that 'the affiliation will enable businesses and communities to develop personal relationships, enhance careers and acquire new skills through workplace exchanges, brand the Bristol Suite with furniture, furnishings and products and so much more’. Local manufacturers Rolls-Royce and L3 MAPPS supplied power and propulsion equipment for HMS PRINCE OF WALES and already have begun to reap benefits of the affiliation available to them and all other organisations and neighbourhoods in the greater Bristol area. ‘Our aim is to kit out the Bristol Suite before she leaves Rosyth dockyard for sea trials in mid-2019,’ explained Mrs Golding. HMS PRINCE OF WALES weighs 65,000 tonnes, has a 10,000 mile range and can accommodate upwards of 40 aircraft on its 4-acre flight decks. His Excellency the High Commissioner for India Mr Y K Sinha was received by Lord-Lieutenant Mrs Peaches Golding OBE for a day long visit to Bristol. A packed programme of events and activities was developed by Dr Parag Singhal and Mr Stephen Parsons DL with the involvement of the Lord-Lieutenant. The visit was designed to introduce the High Commissioner to businesses, medical professionals, Indian students and staff from the City’s Universities, the Bristol Commonwealth Society and to allow time for some cultural activities as well. ‘Given our shared history, common language and similar legal, medical and educational systems, building a broad range of links between Bristol and India can only be of mutual value to both countries,’ explained Mrs Golding. The High Commissioner started the day with a business breakfast organised by Business West. James Durie welcomed the audience of more than 50 business people trading with India, or keen to do so. A presentation by India Market Specialist Ms Ameeta Virk, based at Business West, highlighted the opportunities in, and the successes of, companies in the Indian marketplace. This meeting was followed by a boat trip along the River Avon that pointed out important historical and other items of interest After lunch the High Commissioner visited the University of Bristol where an Indian street market preceded an opportunity to meet students and faculty. 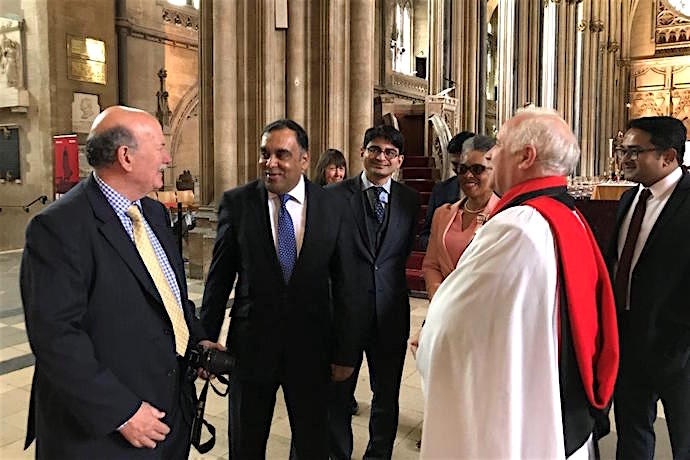 At City Hall, the High Commissioner met members of British Physicians of Indian Origin and other imminent members of the Indian community resident in the City. A keen historian, the High Commissioner learned briefly about the construction of Bristol Cathedral and attended Evensong. 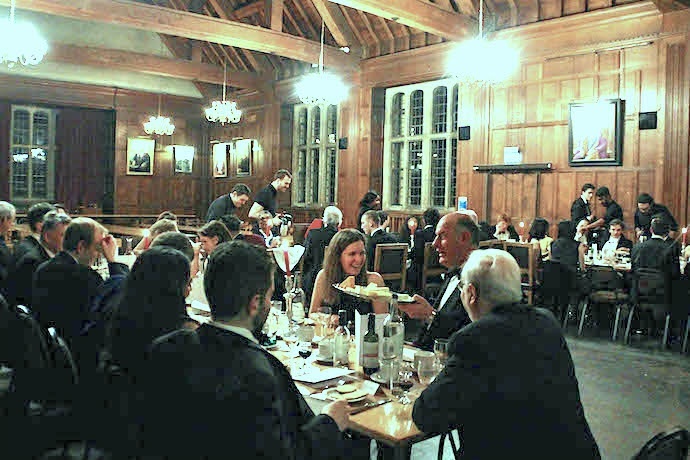 The last activity for the day was dinner at Fort Royal as a guest of the Vice Chancellor and Deans of the University of Bristol together with invited guests. The High Commissioner was accompanied throughout the visit by Dr Singhal and Mr Parsons and through substantial parts of the visit by the Lord-Lieutenant. 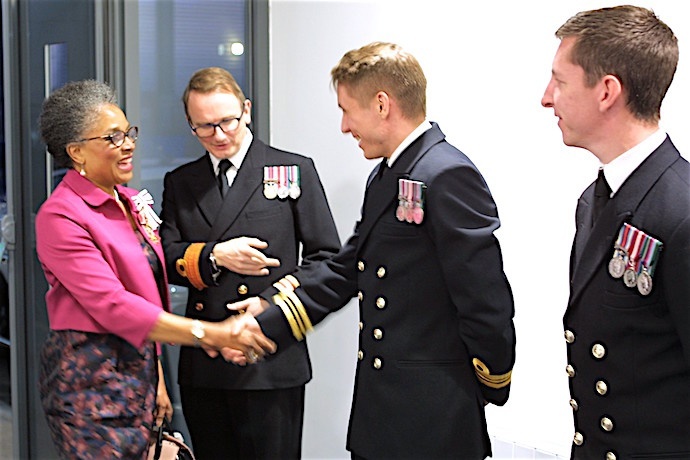 Her Majesty's Lord-Lieutenant for Bristol, Mrs Peaches Golding OBE, was represented by the Vice Lord-Lieutenant, Dr Timothy Chambers, at a ceremony on 19th April 2018 marking the grand opening of refreshed and new facilities at HMS Flying Fox, Bristol's Royal Navy Reserve Training Centre. He was welcomed, with other guests, by the Ship's Company and its Commanding Officer, Surgeon Commander Richard Graham. There was an immaculate turnout and parade of officers and ratings before the ribbon cutting ceremony was performed by Captain R Anderson RN. There followed a tour of the new facilities: classrooms, gym, ratings bar (the officers' ward room will be upgraded last of all) and the highlight, a highly polished Drill Deck. One of the many original features still intact from the building's construction in 1941, it has been in use for the training of servicewomen and men ever since; drill will now become even more pleasurable. Training has continued during this renovation period with the ship's company proving to be extremely flexible and innovative in ensuring a high standard of training has still been delivered. The assistance and support of the Wessex Reserve Forces' and Cadets' Association was acknowledged with pleasure and thanks. The evening closed with refreshments and time to mingle with reserve Navy personnel - who come from an astonishing range of backgrounds. All were enthusiastic about both the refurbishment and their experiences in the Unit, confirming the benefits of reserve service, not only to the country but to their employers and to their own personal and professional development. The group photograph includes four Unit members who are preparing for a fund raising bicycle ride. Bristol joined cities and towns across the country in holding a Big Lunch to celebrate the Commonwealth and the 53 member countries of the Commonwealth. Many people have either outdated ideas about the Commonwealth or know little about the good it promotes. Lord-Lieutenant Peaches Golding OBE explained that member countries are ‘free and equal’ and are united by a common language, history, culture and shared values of democracy, freedom of speech and the rule of law. Among the programmes active across the Commonwealth are the Queen’s Canopy (a project to plant a new forest in each country), the Queen’s Trust (enabling young people in the Commonwealth to help others in their community), the Commonwealth Games, to name but a few. 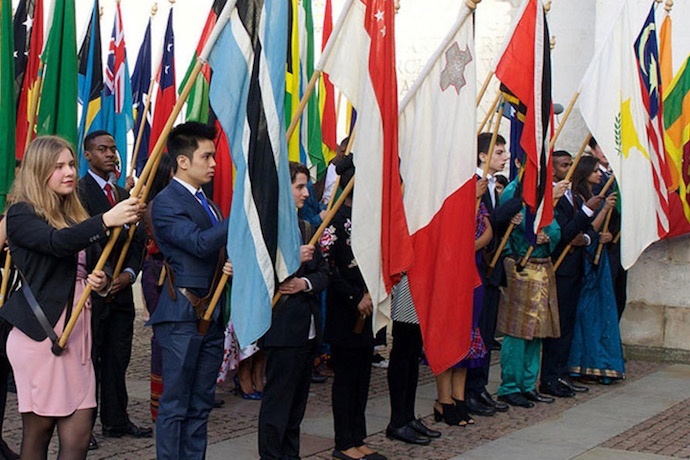 This week, more than 2,000 people from the 53 member countries will assemble in London for the Commonwealth Heads of Government Summit to discuss issues as wide-ranging as the environment and climate change, increasing economic development and trade, and improving health and education. People attending the Big Lunch not only ate delicious food, but also had an opportunity to try on a sari, listen to the Bristol Reggae Orchestra, learn songs from Zimbabwe sung by Millicent and Chadwick, dance and share stories and opportunities. Master of ceremony Sibusiso Tshabalala, from South Africa, encouraged everyone to participate in the event organised by the Bristol Commonwealth Society. 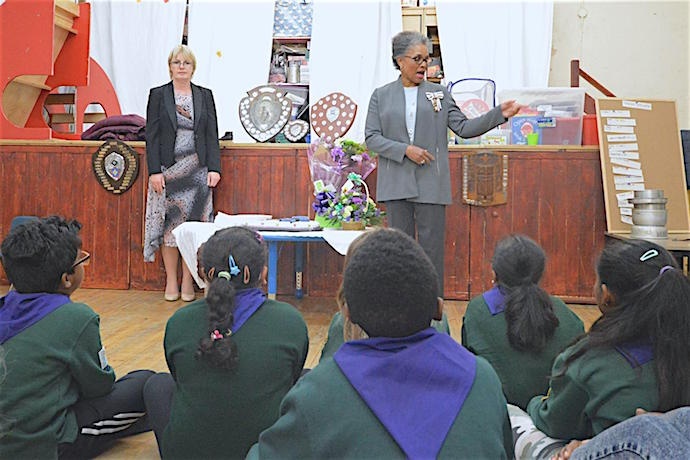 The Lord-Lieutenant Mrs Peaches Golding OBE presented St. George’s Day Awards to 12 distinguished Scouts for their outstanding service. 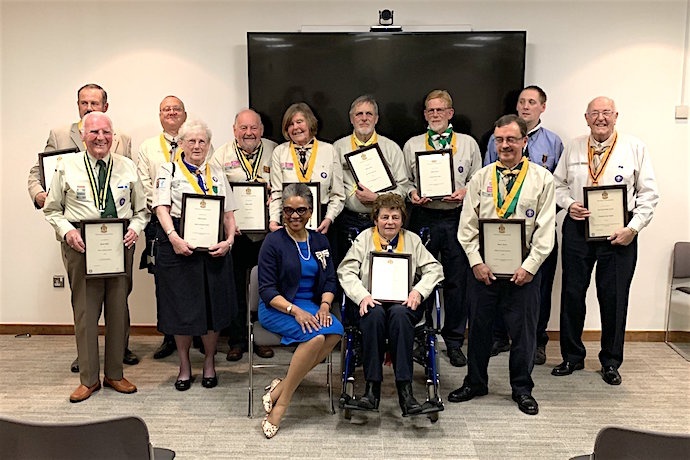 The awards ranged from the prestigious Silver Fox award for exceptional service to the Silver Acorn and Bar to the Silver Acorn, marking at least 20 years of meritorious service to Scouting. Between them, these impressive women and men have given more than 500 years, or 70,000 hours, of service to Scouting; they have changed young people’s lives, strengthened our communities and left the world better than they found it. They have offered exceptional Scouting experiences to over 11,600 young people and supported 3,800 volunteers in the Avon Scout County district. Among many other things, they have opened new Scout Groups and sections, shaped and developed our activities and training, delivered big events and even taken Scouting’s special brand of helping others beyond our shores. The awards are all nominated locally, but are awarded by the Chief Scout Bear Grylls. Each entry has been scrutinised by a national committee. Many of the recipients will attend a national event at Windsor Castle on the 22nd April 2018. The first of two events to mark Commonwealth Day was held on Sunday 11th March at the Lord Mayor's Chapel of St Mark on Park Street. Vice Lord-Lieutenant attended on behalf of HM Lord-Lieutenant of Bristol and was joined by Rt Hon The Lord Mayor of Bristol, Cllr Mrs Lesley Alexander and her consort. The service was officiated by Canon John Rogan. 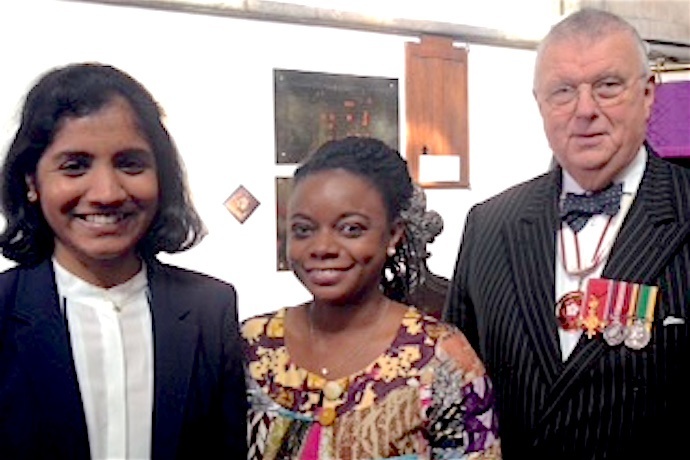 The Vice Lord-Lieutenant read a message from HM The Queen and the scripture lessons were read by two Commonwealth students: Ms Charuni Pathmeswaran (Sri Lanka, pictured on the left) and Ms Nina Pels (Ghana, pictured in the centre). Following the service the Commonwealth party moved to the headquarters of the Bristol Commonwealth Society in Whiteladies Road, where its Chair, Dr Kay Barnard, hosted a reception and luncheon whose guests not only included the ceremonial and civic parties but also many Commonwealth Scholars who are supported by the Society. 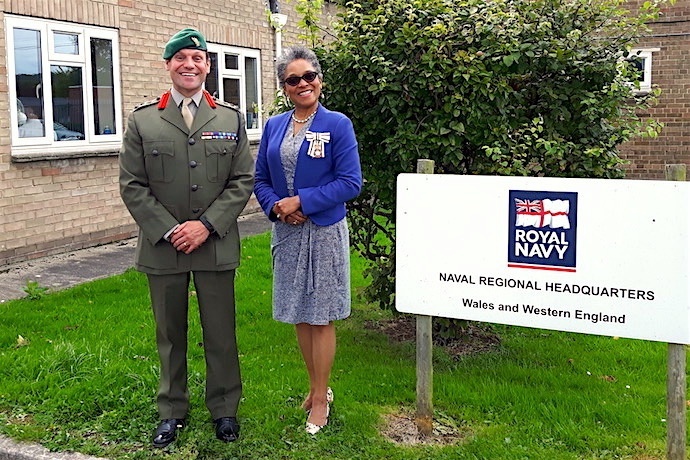 The Lord-Lieutenant and Lord Major of Bristol were special guests of the Royal Navy and Royal Marines Charity (RNRMC) at HMS Excellent this week. They were given a tour of the RNRMC’s offices before being welcomed on board their city’s namesake HMS Bristol by Commanding Officern Lieutenant Commander David Price. Both guests were treated to a presentation and a tour on board the Royal Navy’s training ship in Portsmouth. 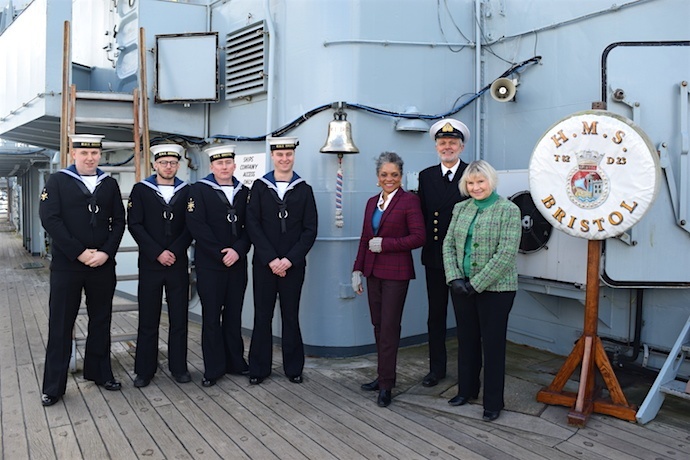 The visit was organised to mark the connection between the city of Bristol and its namesake ship while furthering the relationship between the city and the RNRMC. The ship, which is a Destroyer, was built in the late 1960s and saw action during the Falklands conflict. Today, she plays host to up to 17,000 visitors per year and continues to be a training and accommodation ship docked permanently alongside on Portsmouth’s Whale Island. The City of Bristol Lieutenancy was pleased to be represented at the ceremonies to mark Mother Language Day on Wednesday 21st February in a ceremony hosted by Cllr Sultan Khan on behalf of Bristol City Council. The successful language movement led by students in 1952 ensured that Bengali was preserved as an official language in Pakistan. In recognition of their sacrifice, the Bengali national flag was raised on College Green and a wreath was laid in memoriam. International Mother Language Day has been observed in Bristol every year since February 2000 to promote linguistic and cultural diversity. The theme in 2018 is sustainable development; highlighting that learners must first have access to education in their mother tongue in order to foster learning and development. Local languages, especially minority and indigenous ones, transmit cultures, values and traditional knowledge, thus playing an important role in promoting sustainable futures. International Mother Language Day supports target 6 of Goal 4 of the United Nations’ Sustainable Development Goals (SDGs), which states "Ensure that all youth and a substantial proportion of adults, both men and women, achieve literacy and numeracy.” According to the 2011 census, over 90 languages are spoken in Bristol: English, Polish, Urdu and Somali predominate. The first big event celebrating the 30th Anniversary of the twinning with Bristol and Tbilisi, Georgia, was attended by more than 130 people. The event, a Georgian Supra, was more than a feast of local Georgian cuisine, it was also a cultural evening that was complete with toasts, wine and accapello singing by the Bristol Georgian Choir. True to tradition, the Supra was hosted by a Tamada, a Georgian Master of Ceremony. His job was to invite the dignitaries and others to deliver a brief speech, followed by a toast. Dr. Razvan Constantinescu was the evening’s Tamada and is the Honorary Consul General of Romania in Bristol. The first toast of the evening was made by Her Majesty’s Lord-Lieutenant for the County and City of Bristol, Mrs Peaches Golding OBE. She was followed by toasts from Her Excellency the Georgian Ambassador to the UK, Mrs Tamar Beruchashvili, and The Right Honourable The Lord Mayor of Bristol Cllr Lesley Alexander. A further nine toasts followed, punctuated by songs sung by the Bristol Georgian Choir. The colourful menu included vegetables cooked with walnuts, cold meats, meats cooked in various tasty sauces and salads. Thanks for these wonderful dishes are due to to Bristol Tbilisi Association (BTA) executive committee members Esther Keller-Pickup and Nina Bendukidze. Georgian white and red wine was donated by BTA chairman Derek Pickup. 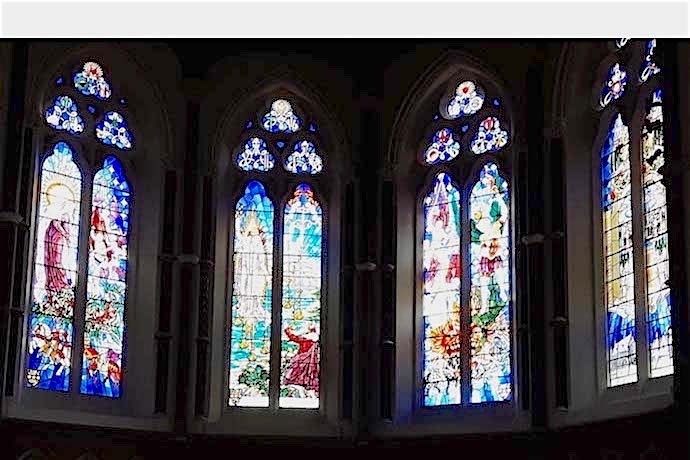 BOOK NOW -- Everyone, regardless of faith, religion or country of origin, is invited to attend an Evensong at 3.30pm on Sunday 22 April in Bristol Cathedral. This celebration will recognise the strengths of the Commonwealth family, in recognition of the Commonwealth Heads of Government Summit held on Wednesday 18th April, 2018. We welcome people associated with the Commonwealth, whether by family, work, friends or interest. You are encouraged to wear traditional costume, national dress or uniform. The British Empire Medal (BEM) is awarded by HM The Queen in recognition of individuals that have performed outstanding services to their communities, either in a paid or voluntary capacity. Just over 300 people in the United Kingdom received a BEM medal in the Queen’s Birthday Honours List of 2017 and three are from Bristol. 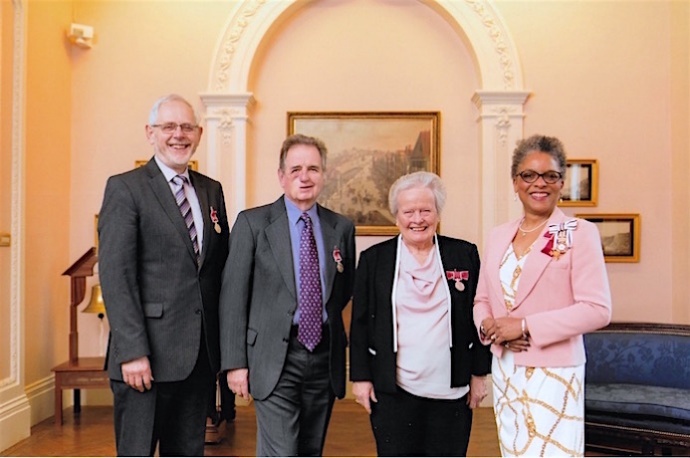 In a ceremony at The Merchants’ Hall on 23 January, the Lord-Lieutenant of Bristol Mrs Peaches Golding OBE presented BEM medals on behalf of The Queen. As pictured left to right here, those recognised for their noteworthy contributions are Mr Peter Wilkinson (for services to music), Mr Duncan Struthers (for services to the community in Hillingdon, London) and Mrs Celia Jane Leatt (for services to the community in Bristol). The proud recipients celebrated their tremendous achievements with light refreshments for their families and friends. 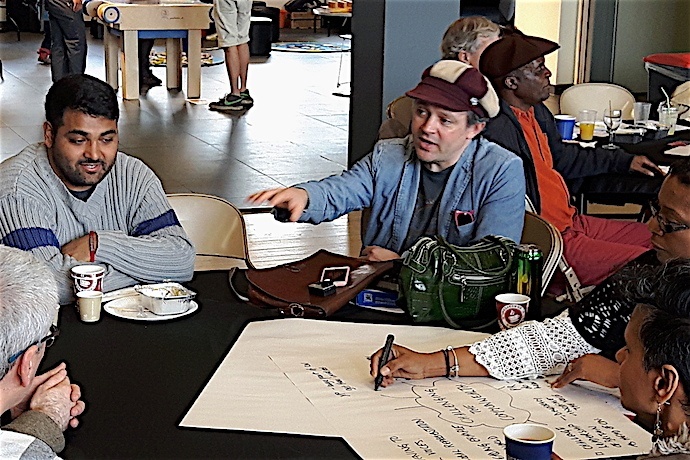 In Bristol there are an estimated 4,500 people living with dementia, a condition associated with a decline in memory or other thinking skills that is severe enough to reduce a person's ability to perform everyday activities. The South West Dementia Brain Bank (SWDBB), in University of Bristol, is housed within the Learning & Research building at Southmead Hospital. It is a resource for the banking of brain tissue generously donated by people to support research into dementia and other neurological conditions and has the potential to contribute to our understanding of the underlying diseases or to be of value to those affected and their families. Almost all major advances in our understanding and pharmacological treatment of dementia have been based on research using human brain tissue. 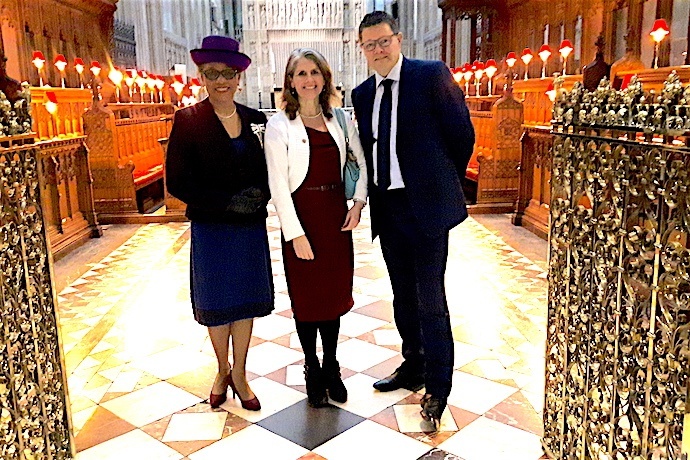 Professor Seth Love (SWDBB Director) and Dr Laura Palmer (SWDBB Manager), pictured right, welcomed Lord-Lieutenant Mrs Peaches Golding OBE to the SWDBB for a tour of the facilities and to share details of updates in dementia research. The causes of dementia are largely unknown and treatment options are limited. Comparison of brain tissue from people who had a disease that caused dementia (such as Alzheimer's disease) with that from people who did not have the disease, helps researchers to identify abnormalities that are specific to the disease and contribute to its development. Over the last 3 years, the SWDBB received 79 requests for tissue and provided 12,986 tissue samples. There are over 13 million people with leprosy in the world, including 214,000 new cases last year. Leprosy is a disease of poverty affecting the skin, the peripheral nerves, upper respiratory tract and also the eyes. Because people with leprosy cannot feel their limbs, they are prone to injury and disfiguration. Over afternoon tea in the Chapter House at Bristol Cathedral, Regional Manager Jenny Foster, pictured here with National Director Peter Waddup, informed the audience about how leprosy affects its sufferers. Peter set out the aim of The Leprosy Mission which is to offer healing and rehabilitation to leprosy-affected people, provide education and job training to those cured of leprosy and increase the supply of clean water to hospitals treating people with leprosy in Nepal and Niger. He said, ‘This is a day where ultra-poor communities affected by leprosy across the globe lobby governments for their basic human rights'. Evensong, led by the Dean of Bristol Cathedral, the Very Reverend Dr David Hoyle, followed the tea. In a poignant service held at The Lord Mayor’s Chapel, the Standard of the Bristol Branch of the Royal Naval Association (RNA) was laid up. 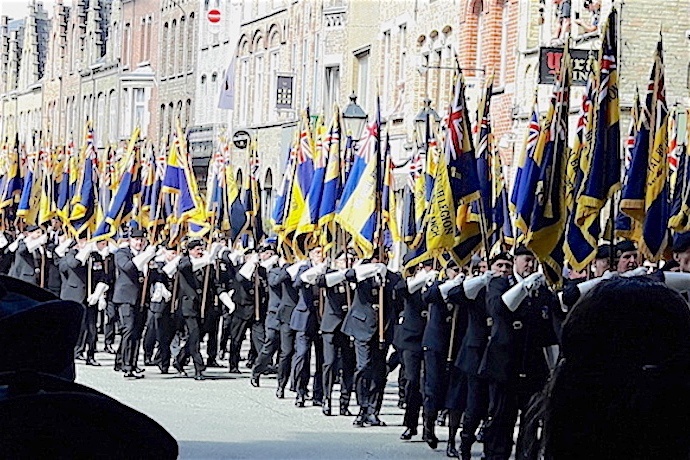 The Bristol Branch, one of 34 RNA branches in the region, joined forces with the South Bristol Branch as numbers of veterans in the branch dwindled. 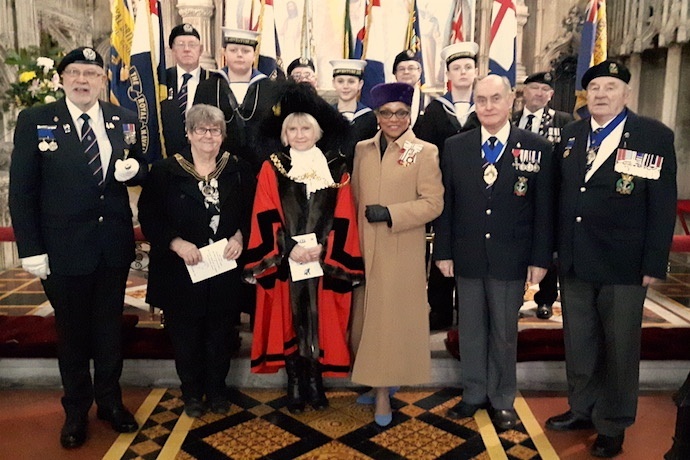 Standard bearers and members from the region, which stretches from Bournemouth to Cornwall and up to Bristol, attended the service alongside the Lord-Lieutenant Mrs Peaches Golding OBE, the Lord Mayor Cllr Mrs Lesley Alexander and Sea Cadets from TS Adventurer. The Lord-Lieutenant passed the Standard to the Lord Mayor for display and safekeeping in the Chapel. After leaving the Chapel, seamen, their friends and families retired for a light lunch at the RAF Club in Henleaze. The RNA, whose motto is “Once Navy, Always Navy," provides a network of support, companionship and guidance for veterans and their families where members can reflect on their time in the Royal Navy and in civilian life in the company of fellow shipmates and their families. The oldest serviceman attending the service at the Lord Mayor’s Chapel was 96 years old. Veterans and their families are welcome to join the South Bristol Branch of the RNA. 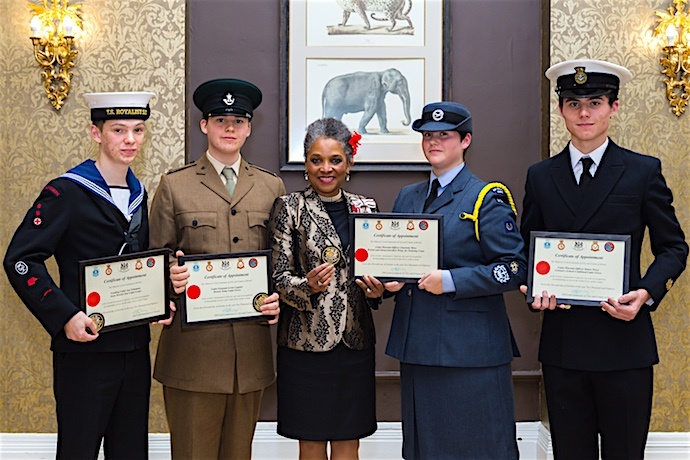 Lord-Lieutenant Mrs Peaches Golding OBE is pleased to announce the three Lord-Lieutenant Cadets who will be supporting her for the next year. Left to right they are Cadet Company Sergeant Jay Thomas, Cadet Flight Sergeant Samana Hassan and Cadet Flight Sergeant Harry Geeson. They were chosen for the role as being outstanding in their level of endeavour, commitment and achievement among a competitive field of Cadets. One or more of the Cadets will accompany the Lord-Lieutenant on significant occasions such as Remembrance Sunday, on Royal Visits and any other activities that may be of interest to them. Being a Lord-Lieutenant Cadet provides great insight into the life of the community, its civic and community leaders as well as key events that highlight and confirm the uniqueness of the City of Bristol. 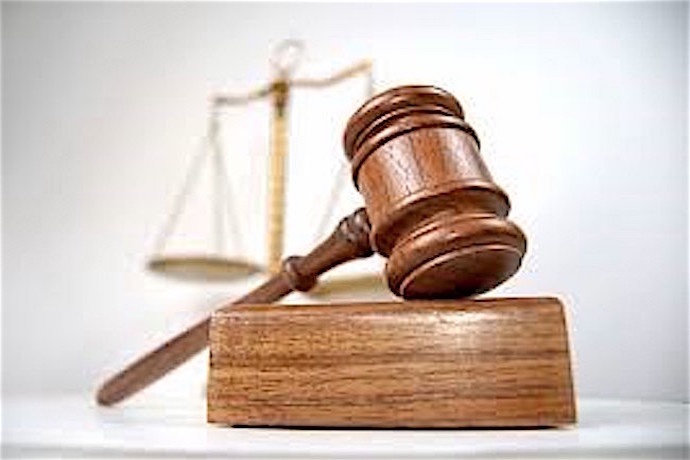 There is a vacancy on the Avon & Somerset Advisory Committee that recruits and maintains the standards of magistrates in the area. If you are objective, a good communicator and understand our diverse community, maybe this is the role for you. Click on the PDF icon below for a job description. Applications close at 4 pm on Tuesday 30th January 2018. ABF The Soldiers' Charity held its 22nd annual Christmas Carol Service in the Clifton College Chapel, conducted by The Reverend Christopher Kinch, chaplain to the 14th Regiment Royal Artillery and The Reverend Nicholas Adley, chaplain to the 1st Regiment Royal Horse Artillery. The Choir of Bristol Cathedral, directed by Mark Lee FRCO, was accompanied by organist David Bednall FRCO. The beautiful Chapel provided the perfect setting for the service. Lesson readers included the Lord-Lieutenant of Bristol Mrs Peaches Golding, the High Sheriff of Bristol Anthony Brown, the Lord Mayor of Bristol Cllr Mrs Lesley Alexander, Major Maikali Nawaqaliva of the Royal Logistics Corps at the Ministry of Defence Abbey Wood, Zoë Spicer from the Bristol University Officer Training Corps and two of the Lord-Lieutenant cadets. Donations were collected to further the work of ABF The Soldiers’ Charity in supporting injured soldiers and ex-soldiers or assisting members of their family that may encounter hardships. Last year the Bristol Committee raised £10,500 to assist soldiers and their dependents in the Bristol area. Following the service a delicious curry supper was served and a raffle supported by Barclays Bank ensured that a nearly a dozen guests won prizes. 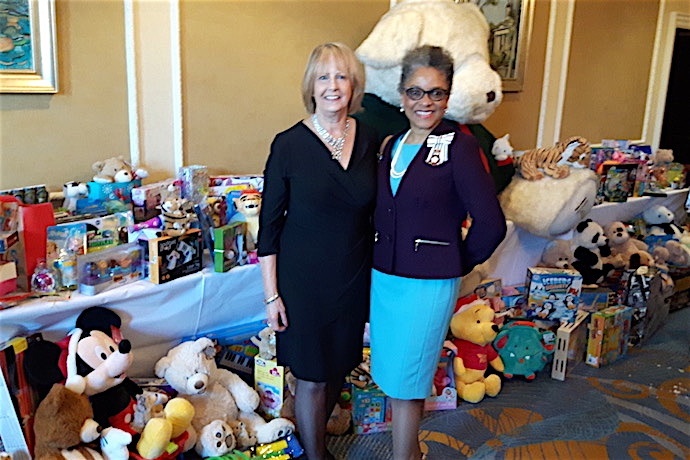 Lord Lieutenant Peaches Golding OBE with Sue Davies DL, a trustee of the Bristol Children's Charity, at their main fundraising event of the year - Christmas lunch at the Marriott Royal. The photo also shows the amazing array of over a hundred toys - presided over by the charity's Harrod's bear mascot - donated by guests. Among the 200 plus supporters attending was a stellar list of VIPs including the High Sheriff and Mrs Anthony Brown, the Lord Mayor and Lady Mayoress along with the patron Terry Waite OBE. Bristol Children's Charity is run by a small group of volunteers with no paid officials, so every penny raised provides items to make life happier or more comfortable for local disadvantaged children. Jemima, the mum of Cali aged 5, spoke movingly at the lunch about how much it had meant to receive a range of sensory toys for Cali and how much she enjoys and benefits from them. An auction and raffle of wonderful donated items, including a beautiful hand-carved rocking horse, helped achieve the target of £8,000 raised at the event. Guests also brought hundreds of toys which will be delivered to children across the city to give them a happier Christmas Day. As well as appealing for sponsorship and donations the charity would really welcome more volunteers - with a few hours a month to spare - to join the committee (just 10 meetings a year held in central Bristol), or take minutes, or simply help with social media or help run an event. Bristol Cabot Choir performed Marc-Antoine Charpentier’s Messe de Minuit pour Noël before a packed audience at the Bristol Cathedral. The Choir, in celebration of its 40th anniversary this year, sang the Christmas mass which is a combination of instrumental music, carols, and noels and was accompanied by organist Andrew Kirk. The work was written around 1690 after the composer returned from three years’ study in Rome. In the second half of the concert, musical director Rebecca Holdeman led both the Choir and the audience in singing a selection of carols and Christmas songs. 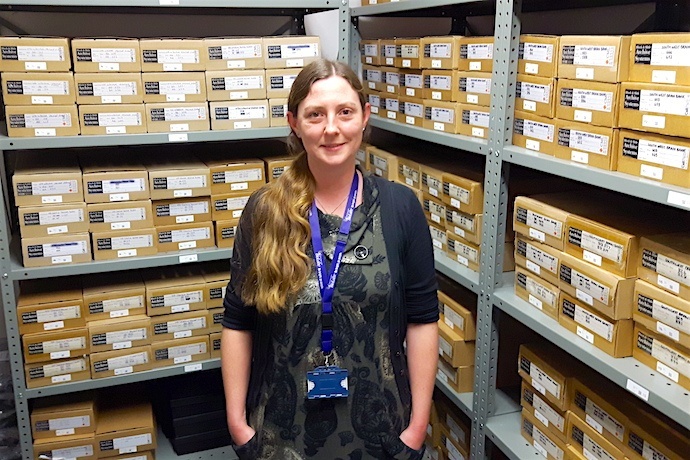 A retiring collection was made in aid of Off The Record, a Bristol charity supporting the mental health of young people through the provision of free and confidential information. On Sunday 10th December the Regional Youth Music Awards (RYMA) took place at Brunel’s famous Passenger Shed in Bristol. The awards ceremony is the high point of the year for the students of Bristol based Community Interest Company (CIC) Studio 7 Academy. 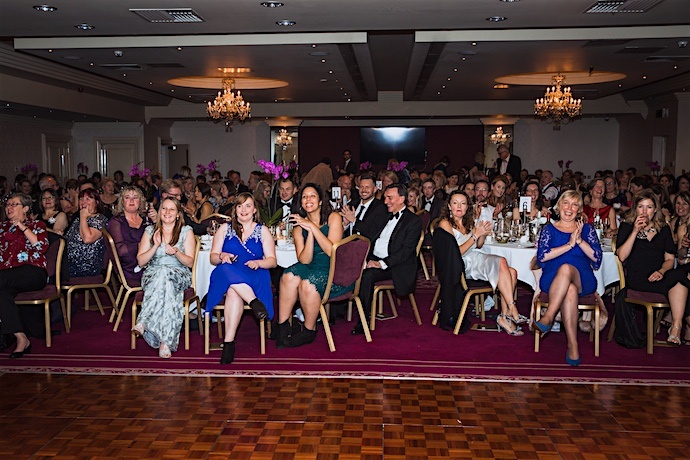 Founder Kizzy Morrell and her team of volunteers celebrated 10 years of working with, and supporting, the best of Bristol’s young musical talent at this glamorous black-tie VIP dinner. The young performers come from across the region and were presented with their awards by Her Majesty’s Lord Lieutenant of the City and County of Bristol, Mrs Peaches Golding OBE. 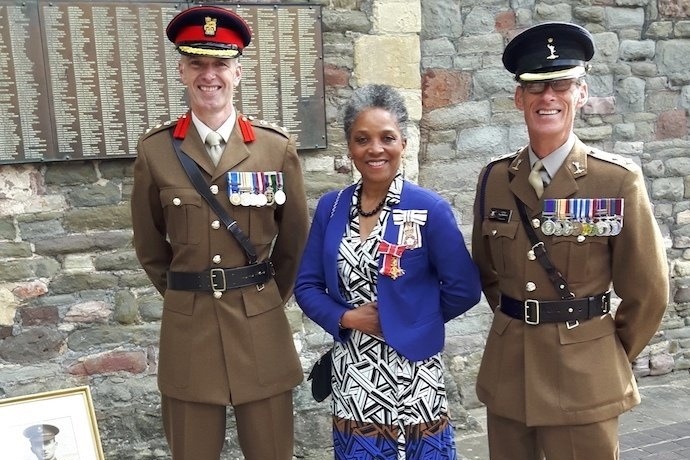 The Lord Lieutenant was joined by well-known local radio and TV presenters Sherrie Eugene-Hart and her husband Patrick Hart of BCfm radio. The audience of over 300 was represented by a whole host of community, civic, business families and international guests. 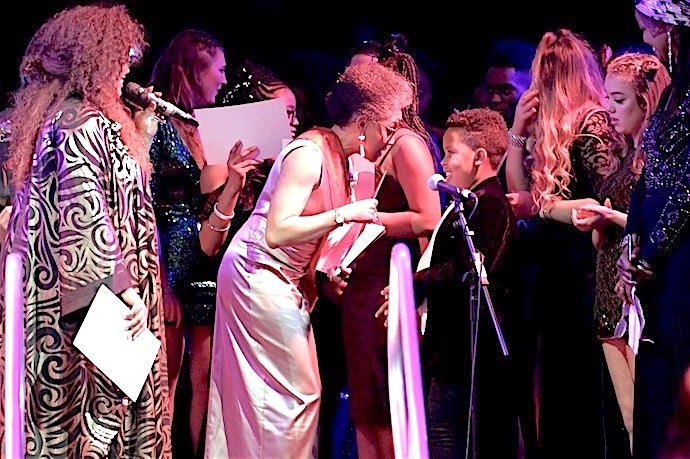 The Regional Youth Music Awards ceremony is a prime example of why Bristol is voted one of the UK’s most diverse City’s and recognised as a leader in Arts and culture. Sponsors Wordlife, ITV, Barclays Bank and BCfm Radio made the evening possible. 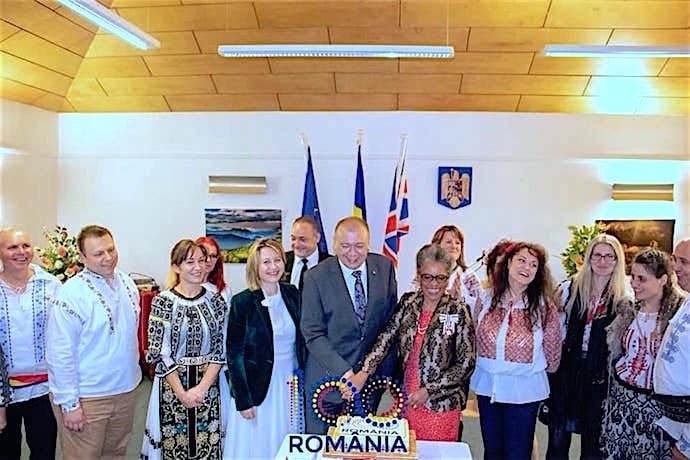 Romanians from as far as Swansea and Plymouth joined Romanians living locally, in London and from their homeland, to celebrate the 99th National Day in Bristol. 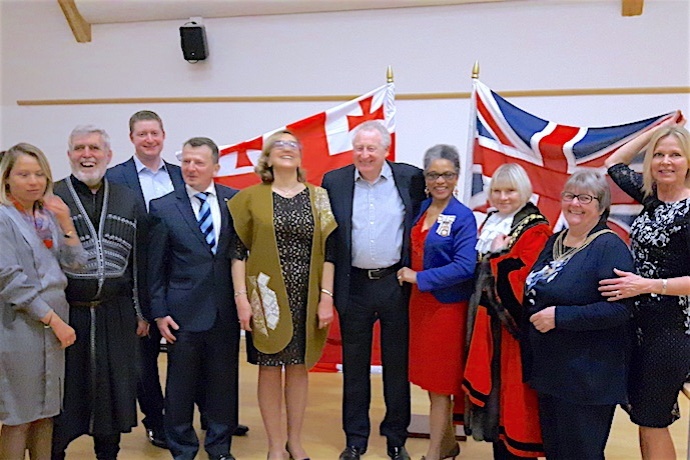 Honorary Consul General Dr Razvan Constantinescu welcomed Lord-Lieutenant Peaches Golding OBE, High Sheriff Anthony Brown, Lord Mayor Cllr Lesley Alexander together with a number of mayors and council leaders from the region. The Lord-Lieutenant congratulated Dr Constantinescu on his recent elevation to that of Romanian Knight for services to the Romanian community and wished the Romanians a happy National Day. She commiserated with those present on the death of King Michael of Romania, a great grandson of Queen Victoria, third degree cousin of HM The Queen and blood relative of Spanish, Greek and Danish royal families. 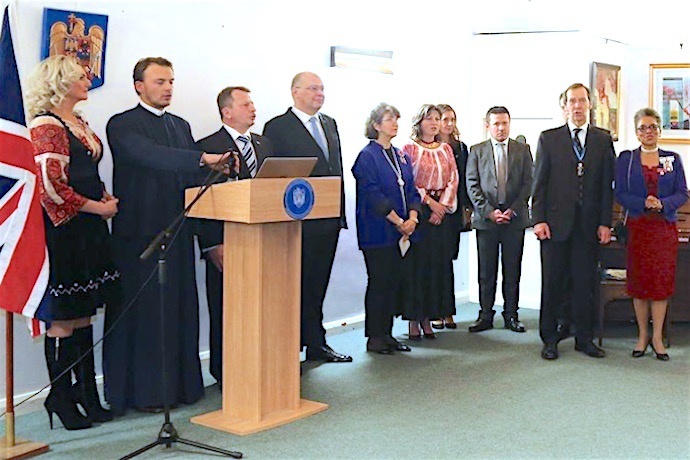 His Excellency Dr Dan Mihalache, in his third visit to Bristol since his appointment as Ambassador to the Court of St James one year ago, noted how friendly the people of Bristol are and how welcome they make him and those from his country feel. There was an exhibition of Romanian icons and paintings, as well as performances on piano and by Romanian singers. Guests were invited to sample a range of traditional Romanian savoury dishes and desserts and taste wines produced in the country. 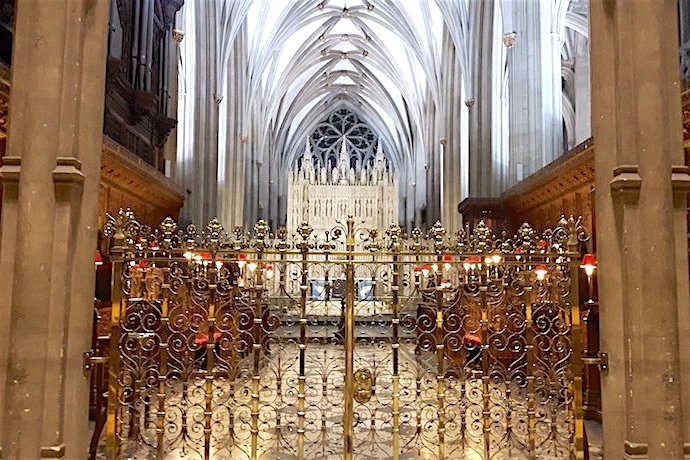 The beautiful St Mary Redcliffe Church provided the setting for the Avon Federation of Women’s Institutes Carol Service. There was not a spare seat to be had as women from across the region came together to celebrate the birth of Christ with a selection of carols, festive songs and readings. 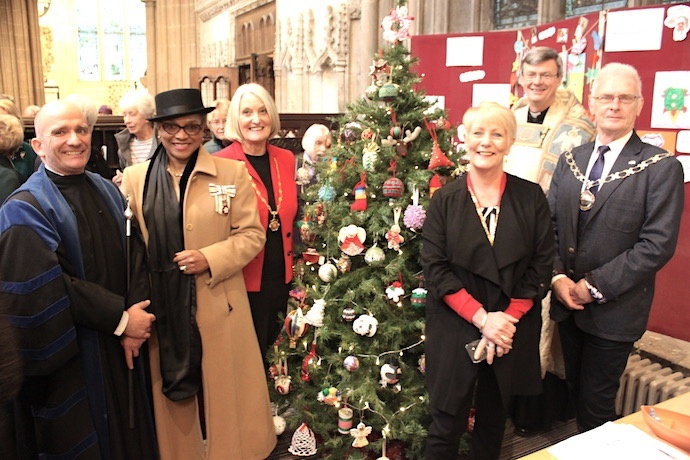 Pictured from left to right are Andy Carruthers (Verger), Lord-Lieutenant Peaches Golding OBE, Jean Sims (Chairman Avon Federation of WIs), ‎Councillor Karen Walker (Vice Chair of Bath and North East Somerset), The Rev'd Dan Tyndall (Vicar of St Mary Redcliffe), and Councillor Ian Blair, (Chairman of South Gloucestershire Council). The baubles on the Christmas tree were handmade by members across the Avon Federation. Her Majesty is the patron of the National Federation of Women’s Institutes. Founded in 1915 to revitalise rural communities and encourage women to become more involved in producing food during the First World War, the WI is the largest voluntary women’s organisation in the UK. It provides opportunities for women to gain new skills, take part in a range of activities and campaign on matters of importance to them and their communities. Geographically, the Avon Federation covers Bristol, Bath and the countryside and coastlines of South Gloucestershire and North Somerset. Diwali is the biggest festival celebrated by Sikhs, Hindus and Buddhists all over the world and celebrates the victory of light over darkness, of knowledge over ignorance, of good over evil and of hope over despair. Family celebrations emphasise peace and goodwill and sometimes small gifts are exchanged as candles are lit. On 10 November Bristol, the Punjabi Forum International, well known for welcoming people from all backgrounds into their community, held a colourful Diwali celebration. The Punjabi Forum celebration of Diwali reinforces the tradition of eating together in order to break down barriers and strengthen relationships. Certificates were presented in recognition of achievement. The High Sheriff, Mr Anthony Brown, presented Mrs Jaspreet Marwah the Certificate for Endeavour; Metro Mayor Tim Bowles presented Mrs Bhola Wante Kaur the Certificate for Extra Courage; Vice Lord-Lieutenant Tim Chambers presented Dr Pawan Rajpal Entrepreneur of the Year Award and Mr Jaswant Singh Azad was presented with the Lifetime Achievement Award for services to the community by Lord Mayor Cllr Mrs Lesley Alexander. Also in attendance were Mrs Meg Thomas and Dr Jo Chambers, Deputy Lieutenants. The evening creates awareness across the Lieutenancy, uniformed services, City Council and others of the traditions and generosity of the Sikh community while also highlighting how Sikhs who have settled in the UK regard this country as their home and motherland. 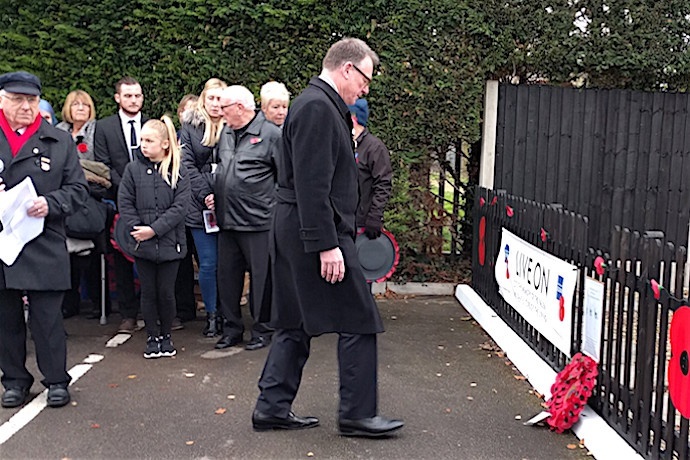 Deputy Lieutenant Revd Richard Pendlebury lays the first wreath on behalf of Her Majesty the Queen during the Remembrance Day Ceremony organised by the Bishopsworth Royal British Legion club. This year approximately 200 people attended the ceremony and many came out of their homes to watch the parade as it moved through the local community. Included was a group of older people from the Bishopsmead Lodge Care Home. It was an excellent commemoration and gets better each year! The Vice Lord-Lieutenant attended the annual Royal Engineers Association, Bristol Branch, Service Of Remembrance held on Armistice Day at the Artillery Grounds, Whiteladies Road. The turnout was impressive in numbers and dignity and it was a pleasure that we were joined by younger Reserve members of 100 Field Squadron (FS), The Royal Monmouthshire Royal Engineers (Militia). This is the oldest senior Reserve Regiment of the British Army, having seen service since 1539, and the only remaining militia unit in the British Army. Its reserve soldiers (men and women) come from all walks of life; science and engineering backgrounds are strong, of course, with a number of PhD members. As well as in Bristol, 100 FS has detachments also in Cwmbran, Cardiff and Swansea. However, the day was primarily for the senior veterans whose spirit, commitment and turnout were both heartening and inimitable. 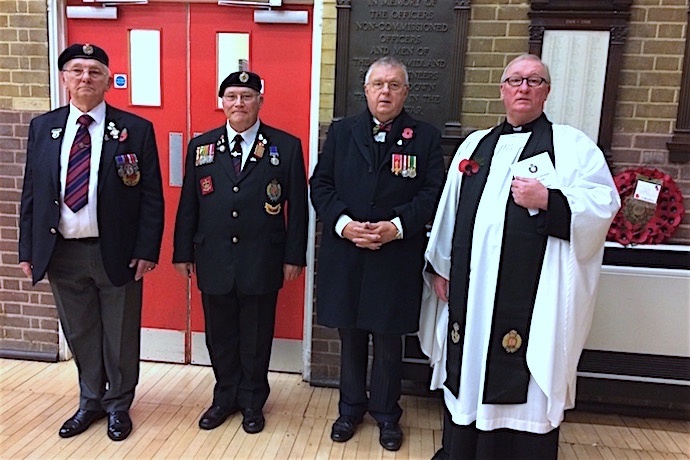 The photograph shows (L to R): Mr David Yeo, Branch Secretary; Mr Dennis Flamson, Branch Chairman; The Vice Lord-Lieutenant; Rev Cavan McElligott, Chaplain, who conducted the service. Two hundred members of the Armed Forces, Reservists, Cadets, veterans and a host of volunteers were out collecting in force on Thursday to launch the 5th Annual Bristol Poppy Day appeal. Every donation and purchase of a poppy will help assist a service man or woman who is experiencing hardship or turmoil in their or their family’s lives. The Bristol Wives Military Choir started the Bristol Poppy Day launch with their singing performance at Cabot Circus. Then followed 8 hours of ceremony, music and entertainment. Similar activities took place at Bristol Temple Meads, the Mall at Cribbs Causeway and in the Centre where the performers of ‘War Horse’ the poignant play about the love of farm boy Albert with his beloved horse Joey during WWI. 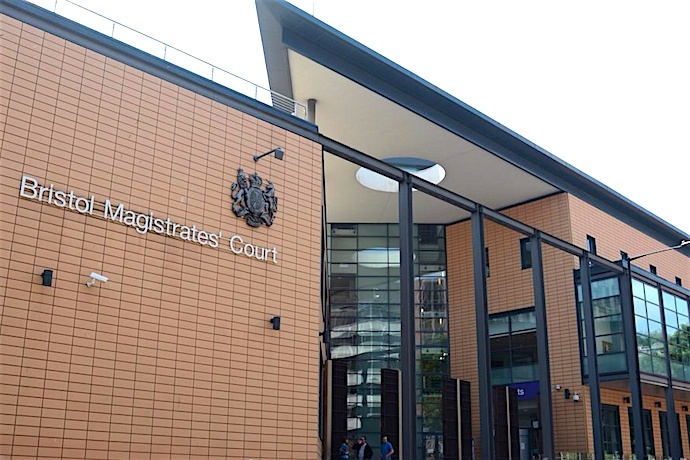 Across the country major cities are also holding similar appeals to those in Bristol. The Poppy Appeal is the biggest fundraising campaign for the Royal British Legion. All across the City and country, people wearing a poppy do so in memory of fallen or injured service women and men. This year we aim to increase the money raised to provide a range of services that improve the welfare of individuals whether for rehabilitation courses or careers advice. Please give as generously as you can so that we can support the Armed Forces community for as long as they are needed. 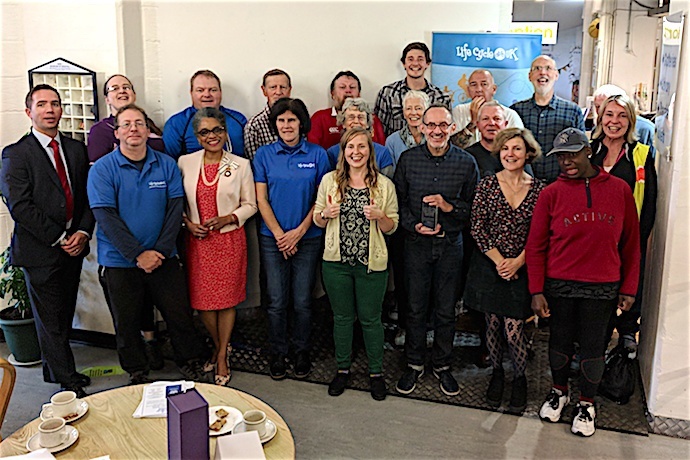 Life Cycle UK achieved the Queen’s Award for Voluntary Service (QAVS), the highest award given to groups across the UK in recognition of the outstanding creative and innovative work done by their volunteers. In presenting the award to Poppy Brett, Chief Executive of Life Cycle, the Lord-Lieutenant Peaches Golding cited that volunteers donated 1,400 hours per year on tandem bicycle rides for blind people in the Two’s Company project. Poppy confirmed that their projects rely on volunteers and without their contributions, their project would not take place. Jenny, a Two’s Company service user said, ’Not only has the cycling improved my well-being and health, it has also boosted my social life and ability to mix with sighted people.’ Trustees, service users and volunteers of Life Cycle attended a brief celebratory event which followed on from a bicycle ride. The charity can now display the prestigious QAVS symbol on its letterhead and printed materials. 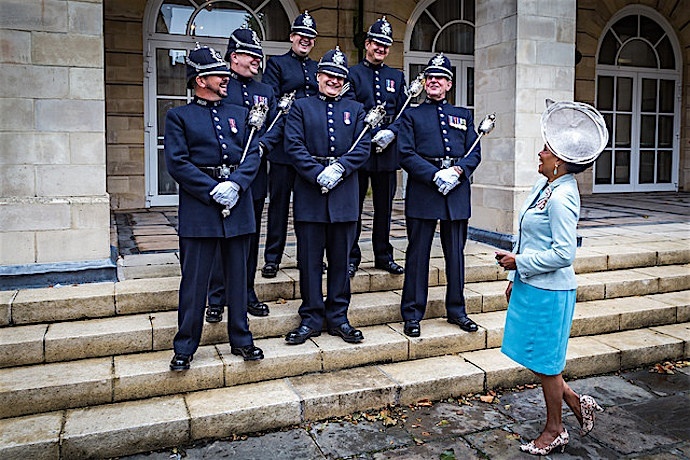 Just received from a supporter is this photograph of the Lord-Lieutenant sharing a joke with the Lord Mayor's mace bearers at the 35th retraining conference in Bristol of the Federal Bureau of Investigation National Academy Associates (FBINAA). See the full story below dated 26 September. The Royal West of England Academy (RWA) is holding its 165th Annual Open Exhibition, a selection of work from its own academicians and external artists. Among the works on display are two watercolour paintings by HRH The Prince of Wales, an honorary Academician of the RWA. On Friday, accountants Smith & Williamson hosted a preview of the exhibition which was attended by the Lord-Lieutenant and Lord Mayor. Alison Bevan, RWA Director, explained 'This dynamic and varied exhibition is a showcase of some of the most exciting artists from across the country and beyond.’ Over 600 oil, woodcut, watercolour or acrylic paintings and drawings, together with sculptures made of porcelain, bronze and ceramics, prints, illustrations, mixed media and photographs will be on display until 3 December. Some of the artworks are for sale. 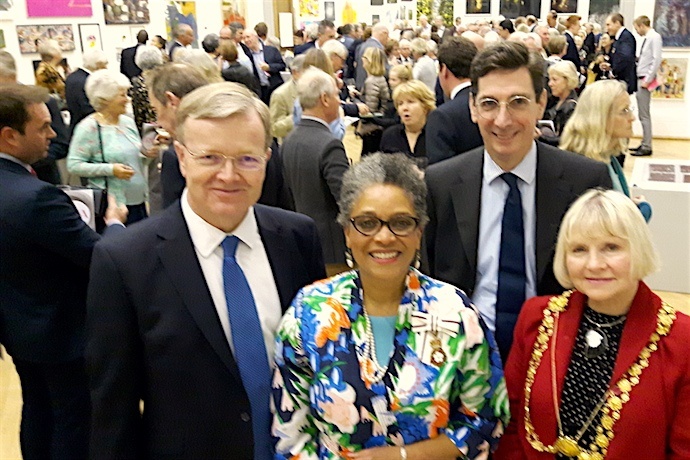 Shown here, from left, are Mike Lea, Senior Partner of Smith & Williamson, Lord-Lieutenant Mrs Peaches Golding, John Erskine, Regional Head of Investment of Smith & Williamson, and Lord Mayor Cllr Mrs Lesley Alexander. 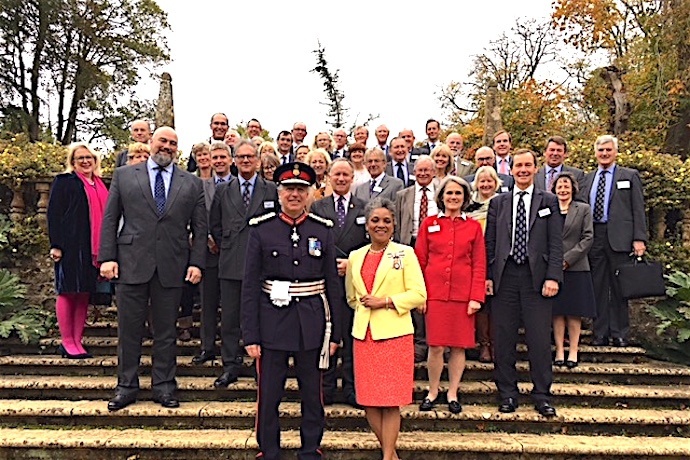 Two Lord-Lieutenants addressed the SW Regional meeting of the High Sheriffs’ Association; they were the Lord-Lieutenant of Dorset Mr Angus Campbell and Lord-Lieutenant of Bristol Mrs Peaches Golding. HM The Queen appoints both the High Sheriff, who focuses on law and order in its widest sense, and the Lord-Lieutenant, who is the personal representative of the Queen, to their roles in each ceremonial county. Peaches Golding highlighted the ways that High Sheriffs, whose term of office is one year, could assist Lord-Lieutenants on issues that divert young people from crime or criminal activities. She encouraged High Sheriffs to recognise the work of the many volunteers that provide activities, educational and physical pursuits for youth in our communities. She also highlighted their responsibilities in identifying people from diverse backgrounds and cultures involved in their communities and businesses whose dedication and impact can be recognised in a number of ways. She congratulated the High Sheriffs on the difference they make in the judicial, probation and prison systems. 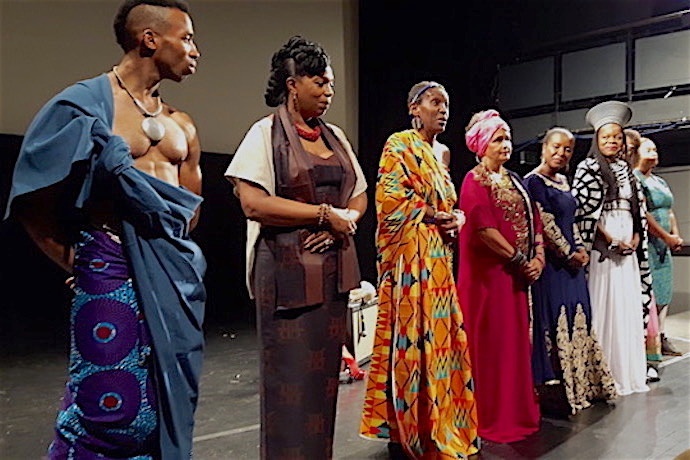 The launch of the Queens of Africa exhibition, one of Bristol's Black History Month events, took place in the theatre of the Arnolfini Art Gallery. With concept design and organisation carried out by Christelle Pellecuer, the launch and static exhibition explores and celebrates the history of both real and legendary queens of Africa or of African origin. Yoma Smith presented the launch event which was opened by the Lord-Lieutenant. At the start of the evening, the stories of seven queens were presented by well-known black Bristolian leaders; a further eleven more models were photographed for the static exhibition. A poem written by local poet Edson Burton was delivered by artist and actress Cleo Lake. Sisanda Myataza and Simwinji Zeko performed original music that blended South African and jazz musical traditions. Closing remarks for the educational and inspirational exhibition launch were delivered by respected elder Barbara Dettering. The exhibition will be available for viewing during Black History Month at UWE Bristol, the Test Space at Spike Island and the Bristol Cathedral. 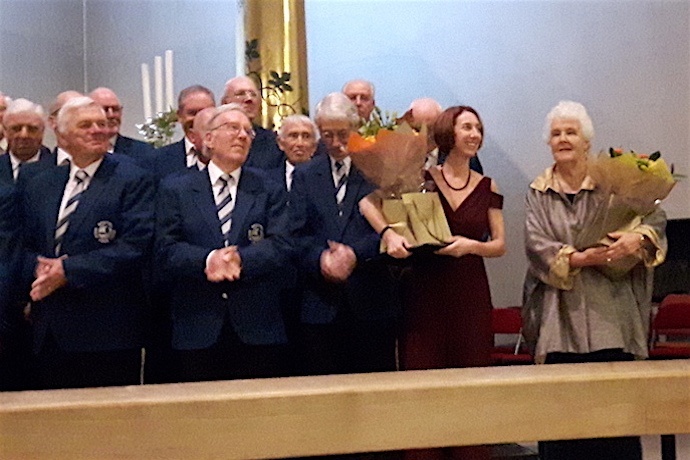 BRACE, the charity that aims to defeat dementia, celebrated its 30th anniversary with a concert of exceptional quality, held at All Saints Church, Pembroke Road, Clifton. 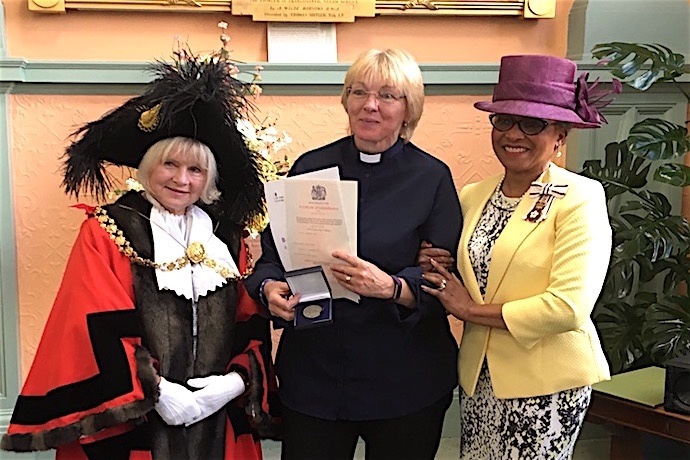 In attendance were the Lord-Lieutenant Mrs Peaches Golding, the High Sheriff Anthony Brown and Mrs Brown and the Lord Mayor Cllr Mrs Lesley Alexander. Artistes included the virtuoso violinist Julia Hwang, who performed Vaughan Williams’ timeless classic ‘The Lark Ascending’ and a medley of songs from the musical ‘Porgy and Bess’. Soprano Deborah Gjeloshaj, who studied at the prestigious Milan Conservatoire, sang four love songs from composers including classical pieces by Dvorak and Puccini and more modern songs such as ‘Until There Was You’ and ‘That’s Him’. Bristol Old Vic Theatre School-trained Stephanie Cole OBE read two pieces, both of which had the audience spellbound. Throughout the programme the Bristol Male Voice Choir sang a number of songs that stirred the emotions. Money raised from the concert will enable BRACE to fund more research into the causes and potential cures of all forms of dementia. 27 photographic images and videos dating from the 1880s to the 1960s form an illuminating exhibition at the Bristol Museum and Art Gallery. Each image was chosen by a photographer, historian, relative of those working in the Commonwealth or others living at that time as representing their memories of life in the Empire. The Lord-Lieutenant attended the launch of the exhibition which will remain until 31 August 2018. She noted that the text associated with each image told the story of why the image was selected and identified historical events or activities across the Empire that were happening during the same period of time. The Museum has a large photographic archive, some images of which shed light on private and public aspects of life in the Commonwealth and beyond. 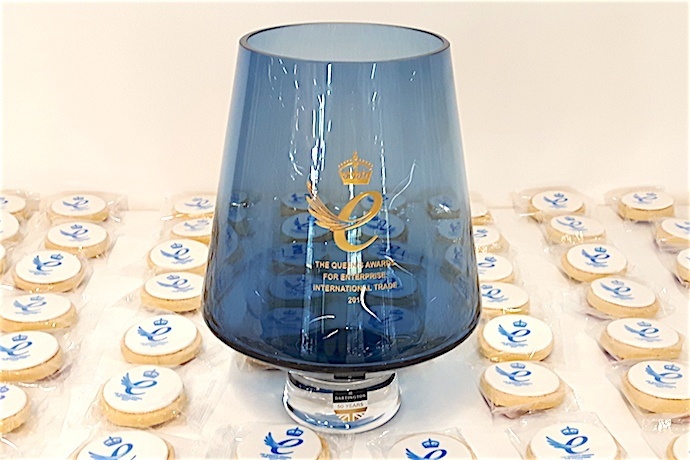 The Lord-Lieutenant presented the prestigious Queen’s Award for Enterprise vase to Andrew Nisbet, chairman and founder of Nisbets, the catering equipment supplier. Nisbets was recognised for their Outstanding Growth in Export Sales, having grown by 205% in the six years since 2010. The business trades in over 100 countries worldwide, has direct sales operations in nine territories and operates 35 retail outlets around the world. The handover of the vase and a certificate from HM The Queen took place in the recently opened National Catering Equipment Centre in Avonmouth where the company stocks its best selling products, has training rooms, exhibition space and a fully operational cooking lecture theatre with top of the range professional catering equipment. Nisbets can display the Queen’s Award emblem and fly the Queen’s Award flag from its premises for the next five years. The Queen’s Awards for Enterprise recognise businesses that are excellent at international trade, sustainable development or innovation. They are the highest official UK awards for British businesses. This vehicle was seized from a convicted drug dealer who is currently serving a prison sentence. 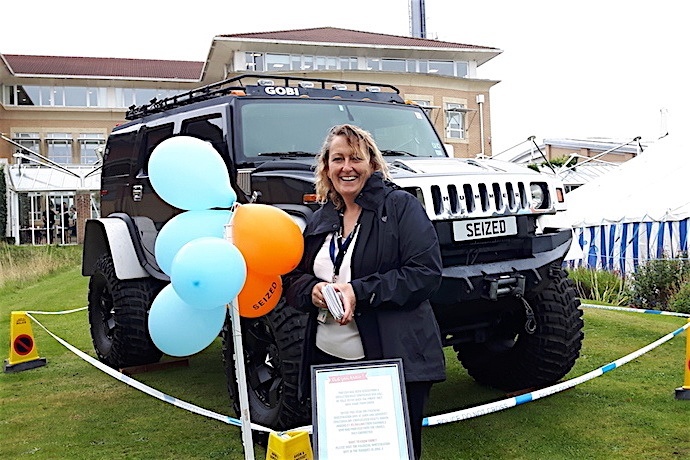 The message that crime doesn't pay was one of many featured during the Emergency Services Open Day at Avon & Somerset Constabulary, Portishead, Bristol, which was attended by the Lord-Lieutenants of Bristol and Gloucestershire. ‘The sale of seized goods obtained through theft, fraud or other crimes is taking the cash out of crime,’ explains this senior member of police staff, Dr Kirstie Cogram, who heads up the Financial investigation Unit.. 'This vehicle will go on sale to the public later this week and the money raised will go back to the state.' The Emergency Services Open Day featured Avon & Somerset Police (and their many specialist functions including those mainstream officers trained and equipped to respond to events where there is fear of contamination from Chemical, Biological, Radioactive or Nuclear material, Scenes of Crime, Mounted Police and Dog Section), the Fire and Rescue Service, British Red Cross, and Coastguard and Cave Rescue, among others. The aim of the Open Day was to entertain and inform a crowd of more than 7,000 members of the public of all ages about the work of the various Emergency Services. The Lord-Lieutenant, Mrs Peaches Golding OBE, Patron of the Bristol Commonwealth Society, was keynote speaker at today’s Society lunch. The UK is a microcosm of the Commonwealth, with 50% of the population having an ancestral or other connection. From January 2018 the royal family will be involved in a number of engagements celebrating the Commonwealth, including visits to many Commonwealth countries. Of importance will be Commonwealth Day (Monday, March 12), the two weeks of the Commonwealth Games in Queensland, Australia (Wednesday 4 - Sunday 15 April) and then the Commonwealth Heads of Government Meeting will take place in London from Monday 16 April onwards. Topics of discussion during the forums at the Meeting will include Women, Civil Society, Young People and Business. 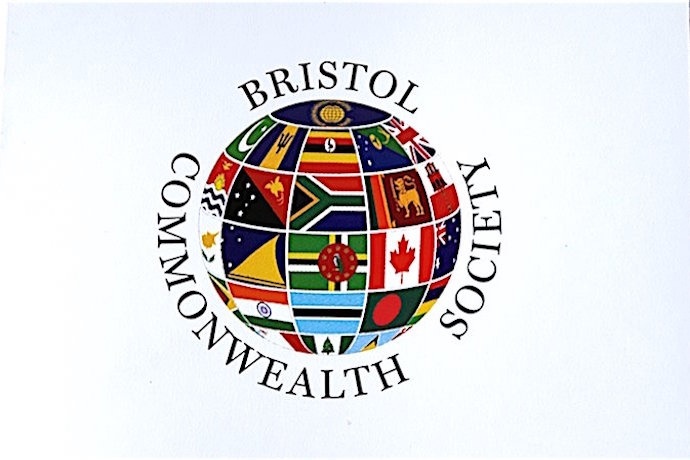 The Lord-Lieutenant challenged the Bristol Commonwealth Society to compile a diary of events taking place across the City in 2018 that align with the theme of the Commonwealth so that she can inform The Queen of activities taking place in Bristol. She also spoke of the Queen’s Commonwealth Trust which funds young people who have ideas on how to improve their communities. With due diligence, and support where needed, these young people run their own small-scale charitable initiatives or social enterprises which provide local solutions to local problems. Although the level of funding is small, the idea of youth-led development is acknowledged by many agencies as an effective means of enabling young people to be equal partners in making the world a better place. 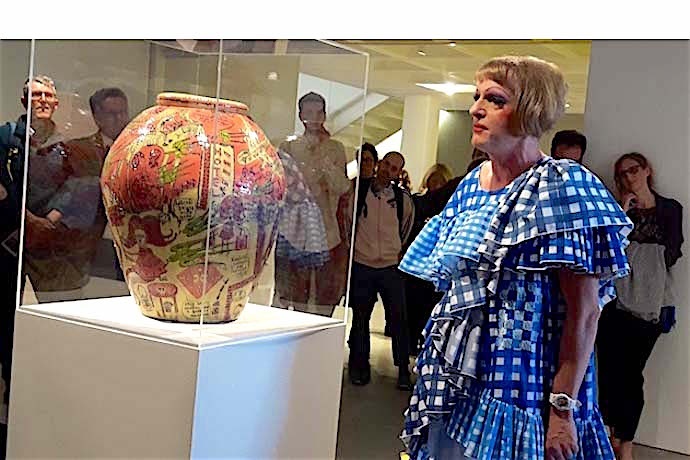 Charismatic Grayson Perry enthralled invited guests at the preview of his new exhibition ‘The Most Popular Art Exhibition Ever!’ which has opened at the Arnolfini Art Gallery until 24 December. In a preview to his exhibition, Grayson spoke to the invited dignitaries and guests about the intention and motivation behind his latest exhibition. The works - in ceramics, metal, print, tapestry and painting - explore issues ranging from BREXIT and religion to masculinity and class. Here Grayson explains to the audience how he produced the vase shown. Starting with a hand-built coil pot, he added glazes, texts, more glazes and finishes. He explained how his art is developed from ideas, phrases and images used by the British public and how we have more common interests than diverging ones. This is the first time this art exhibition has been shown outside London. Director Claire Doherty also encouraged visitors to the Arnolfini to participate in its ‘Imagine New Rules’ consultation that will inform the next stage of development for the Gallery; it runs concurrently with the Grayson Perry exhibition. The Federal Bureau of Investigation National Academy Associates (FBINAA) held its 35th retraining conference in Bristol. 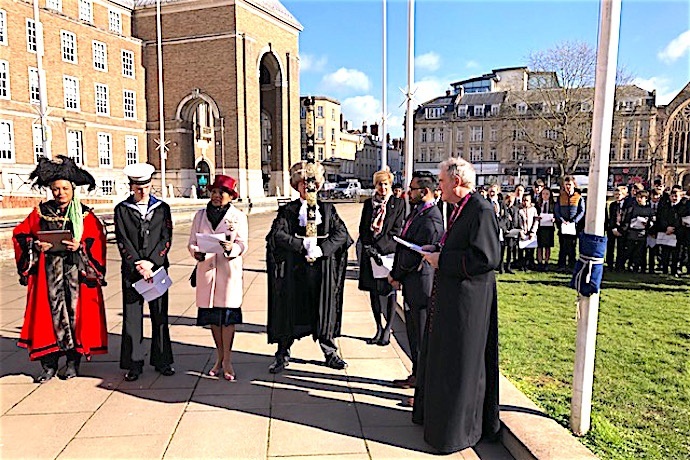 The Opening Ceremony involved the Lord-Lieutenant, High Sheriff and Lord Mayor of Bristol together with eight of the Lord Mayor's Mace bearers from Avon and Somerset Constabulary. Approximately 300 delegates from the FBI posted in the US and in US embassies around Europe were joined by chiefs of police forces from 42 European countries. In the opening speech by Lord-Lieutenant Mrs Peaches Golding, she informed the delegates that the role of Lord-Lieutenant was created by King Henry VIII in 1536 to form militias to deal with wide-ranging threats. She noted the importance of bringing together delegates whose role is to face modern-day global threats and hazards. She noted the significance of the formal and informal networks created and their role in increasing the effectiveness of cross-border working. She congratulated delegates on their 35th annual conference and welcomed them to Bristol. She hoped their conference would be successful. Among keynote speakers were the Executive Assistant Director of the FBI Mr Paul Abbate, the Director General of the UK National Crime Agency Ms Lynne Owens and the Director General of Europol Mr Rob Wainwright. 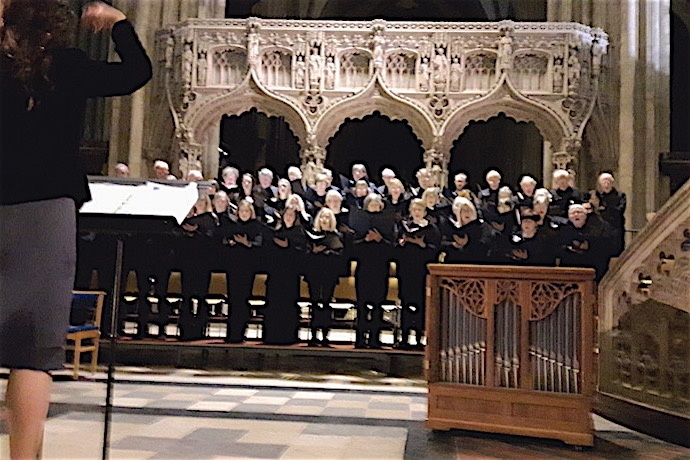 A banquet was held in the nave of Bristol Cathedral on 26th September where choral performances by the Cathedral Choir entertained the delegates. 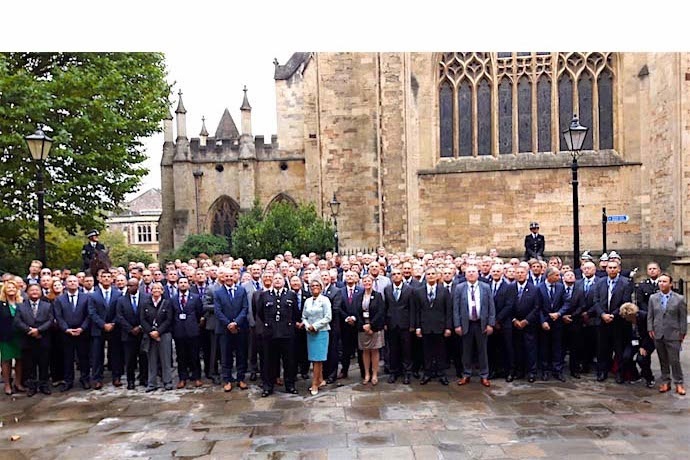 Among the dignitaries were the Police and Crime Commissioner Ms Sue Mountstevens, the Avon & Somerset Chief Constable Mr Andy Marsh and the Dean of the Bristol Cathedral Very Rev Dr David Hoyle. The event was organised by the Chief Constable of Staffordshire Mr Gareth Morgan (formerly Assistant Chief Constable of Avon & Somerset Constabulary). 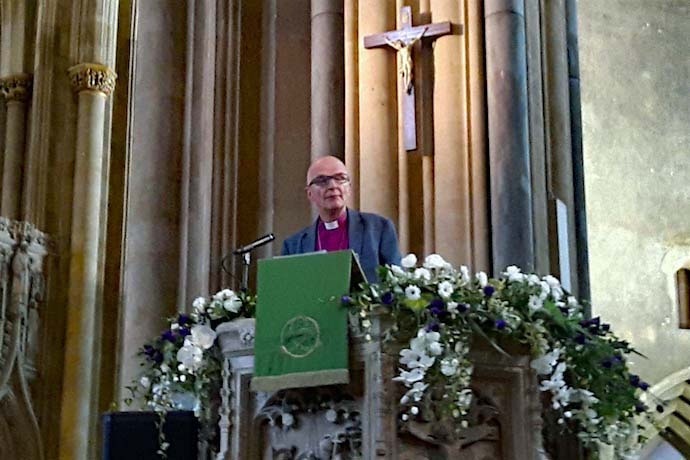 The Right Reverend Bishop Mike Hill delivered his last address as Bishop of the Diocese of Bristol before a packed congregation at the Bristol Cathedral on Saturday. The service was attended by his wife Anthea, their family, clergy from all corners of the Diocese as well as three current Lord-Lieutenants and three retired Lord-Lieutenants. Bishop Mike and Anthea came to Bristol in 2003 from the Diocese of Oxford. He became a ember of the House of Lords in 2009. The service demonstrated his passion for preaching the word of God in an accessible and engaging way. The Cathedral Choir, the Renewal Gospel Choir and a guitarist in turn led hymns sung in full voice by the congregation. The couple will retire to Clevedon. The search for the successor to Bishop Mike will be carried out by the Vacancy in See Committee and will begin shortly. For 30 years, the musical charity Changing Tunes has enabled prisoners to tap into their creativity and emotions in 16 prisons across the UK. Today at HMP Bristol, the charity brought together ex-prisoners and Changing Tunes musicians to celebrate not only this milestone anniversary, but also the charities’ partnership with the prison. 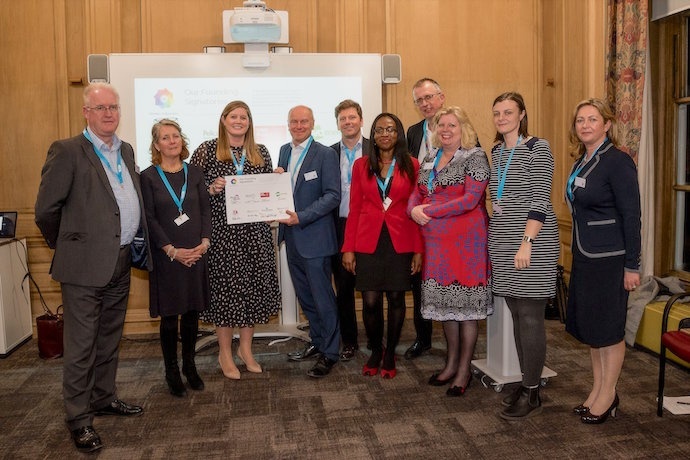 Changing Tunes’ CEO Lizzie Bond, HMP Bristol Governor Steve Cross and the charities’ Founder, Richard Pendlebury were joined by the Lord-Lieutenant and a number of VIPs from around the city and county. HMP Bristol’s Changing Tunes five-piece prisoner group, led by Rob Davies, Musician in Residence, performed a number of well-known songs to which the audience tapped their feet and joined in the singing. The atmosphere was in marked contract to normal prison life. 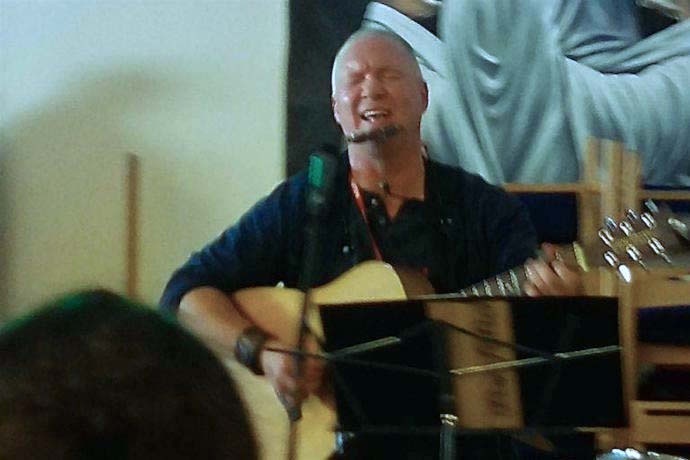 Musician and songwriter Arty, an ex-prisoner whom the charity met inside 10 years ago, spoke eloquently about his life and how through music he was able to express his emotions. He performed his own songs containing heartfelt lyrics and striking melodies. The charity Changing Tunes, working in prisons and their communities post-release, has gone from strength to strength, helping people live a life after prison that is free from crime and full of meaning and purpose. Changing Tunes will be continuing the celebrations with a 30th Anniversary Concert on October 21st at Redland Parish Church, Bristol (tickets on sale via their website) and will also be releasing a 30th Anniversary album entitled ‘Thirty’. This will be a special compilation featuring ex-prisoners in partnership with Billy Bragg and Frank Turner, and will be available to buy at the concert. All proceeds will go directly to the charity to help them continue their work. For the first time since World War II, the Wales and Western England Naval Region will be commanded by a Brigadier. Brigadier Graeme ‘Jock’ Fraser MBE Royal Marines brings a wealth of experience to the region ranging from his peace-keeping, disaster-relief, military and diplomatic roles in Arctic environments as well as in the Caribbean, West Africa, Middle East and the USA. Effectively the Naval Attaché for the region, his responsibilities include the coordination of Naval Service support to the civil authorities in time of crises; liaising with the civic community; coordinating arrangements for Royal Navy and foreign warships visiting commercial ports; representing the Royal Navy at ceremonies and public events and supporting numerous Regular Navy, Royal Marines and Maritime Reserve units in the region. The Brigadier was awarded the MBE in December 2015 for his role over two years with the Joint Forces Headquarters, the UK’s extremely high readiness headquarters, engaged in military responses to a range of crises around the globe. The Lord-Lieutenant welcomed the Brigadier to the City on the third day of his command at Naval Regional Headquarters at HMS FLYING FOX. The City of Bristol is affiliated with the new aircraft carrier, HMS PRINCE OF WALES, currently in construction at Rosyth shipyard in Scotland. 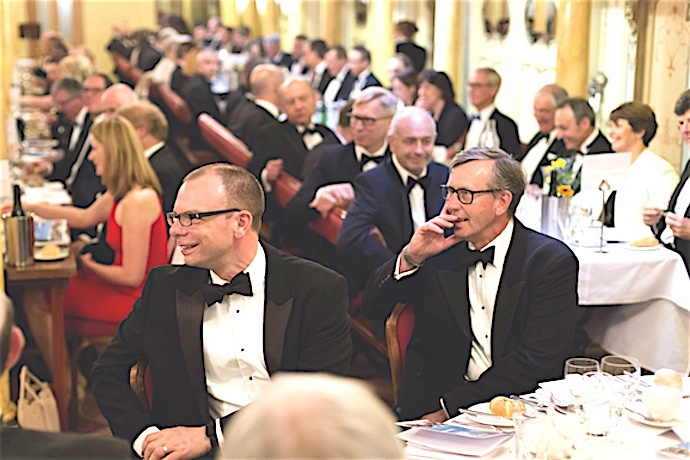 Over 170 military, civic, and political leaders from the UK, the USA and France attended a Dinner at the Institute of Directors in London, hosted by Admiral Sir Philip Jones KCB ADC, First Sea Lord and Chief of Naval Staff. 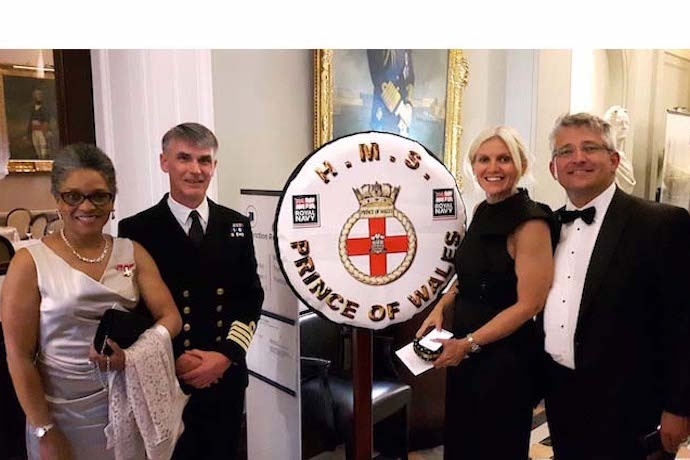 Pictured are Sarah Pullen (Trinity Mirror regional managing editor for Bristol, Gloucestershire, Bath, Somerset and Dorset) and James Durie (Director at Bristol Chamber and Initiative at Business West) who joined the Lord-Lieutenant and Captain Ian Groom, the first captain of HMS PRINCE OF WALES. The keynote speaker was Secretary of State Sir Michael Fallon. He emphasised the importance of the new aircraft carrier to Britain over the next 50 years. It will be used for diplomatic, disaster relief, hosting trade exhibitions as well as for defence reasons. HMS PRINCE OF WALES, together with her sister ship HMS QUEEN ELIZABETH, are the largest warships ever built in Britain. Her construction created and sustained 8,000 jobs at six British shipyards. The 65,000 tonne vessel has four acres of flight deck and stands as tall as The Shard building in London. The dinner was attended by dignitaries and business leaders from Bristol, Liverpool and London as these locations are affiliated with the ship. On 8th September, the Lord-Lieutenant and Lord Mayor of Bristol attended the actual naming ceremony in Rosyth in the presence of TRH The Duke and Duchess of Rothesay, the titles for TRH The Prince of Wales and The Duchess of Cornwall when they are in Scotland. Both the Lord-Lieutenant, Lord Mayor, the Bristol Chamber of Commerce and Junior Chamber of Commerce were among visitors to Rosyth earlier in the year. The City, its businesses and residents are exploring how best to establish and maintain links with HMS PRINCE OF WALES during her 50 year lifespan. A FULL DESCRIPTION OF THE NAMING CEREMONY, WITH PHOTOGRAPHS, CAN BE FOUND UNDER THE MENU HEADING "BRISTOL AND THE ROYAL FAMILY" AT THE TOP OF THIS PAGE. Bristol is a welcoming and diverse city. 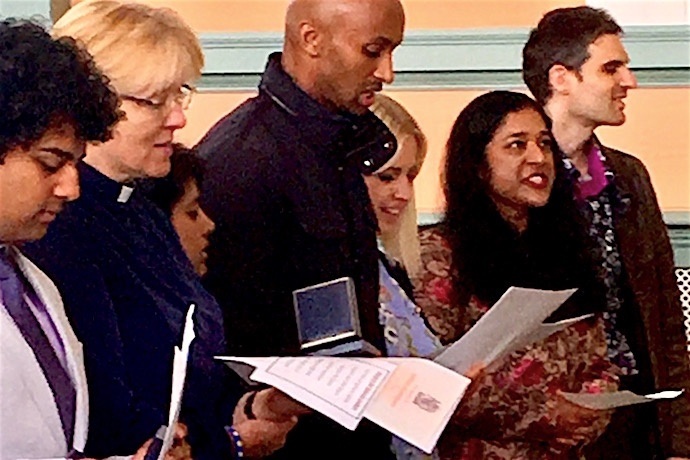 Once a fortnight there is a citizenship ceremony, an event involving around 30 people that highlights British values of tolerance, freedom of speech, diversity and respect for others. The ceremony is the culmination of an application process taking up to three or more months. Applicants must be of good character and have a knowledge of life in Britain. In most cases they have lived here for more than five years. Bristol's newest citizens are welcomed to the city in a ceremony where they pledge an oath of allegiance and receive a silver medal from the City to mark the culmination of a three month process to become a British citizen. The Lord-Lieutenant was particularly pleased for her friend, a chaplain, who herself was naturalised in today’s ceremony. Thirty individuals from four continents and 18 different countries took part in this latest ceremony and demonstrated considerable pride in what they had achieved, as seen in their broad smiles and the many photographs taken by the their sponsors and families. The Lord-Lieutenant, Lord Mayor and Colonel Mike Duff revealed a paving stone to commemorate the heroism of Acting Lance Corporal Frederick George Room, recipient of the Victoria Cross. Room was born in Horfield, Bristol. He was recognised for his tremendous acts of courage as a stretcher bearer during a battle at Frezenberg, Belgium, that took place exactly 100 years ago. In November 1917, Room was one of 126 service men presented to King George V at an investiture ceremony on Durdham Downs. After a long illness, Frederick Room died in hospital in Bristol on 19th January 1932, aged 36. He is buried at Greenbank Cemetery and his Victoria Cross is on display at the National Army Museum, Chelsea. It is possible to run out of superlatives when describing the early morning take-off at Bristol International Balloon Fiesta! 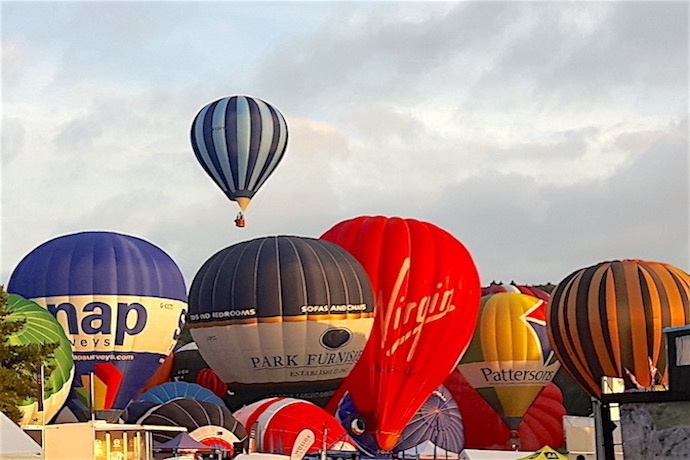 103 balloons wafted upwards over Ashton Court Estate and across the City. Balloons were of all shapes and sizes, some with a small crew and a few passengers, others with large baskets full of people. Rumour has it that, on landing, some of these larger parties cracked open several bottles of champagne in noisy celebration of an exhilarating drift through the skies over Bristol. 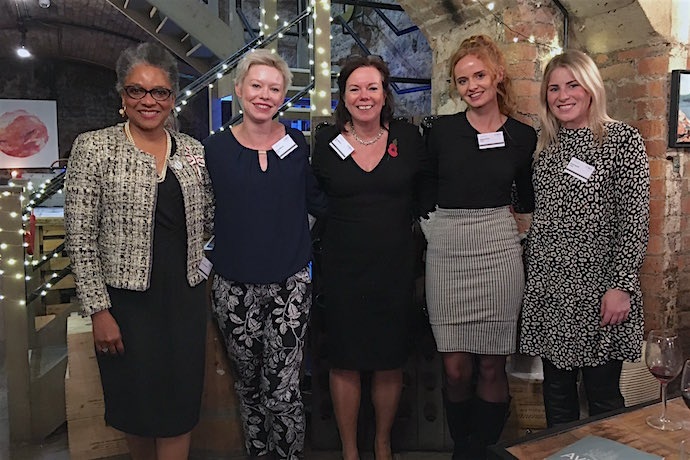 Following the launch, solicitors Thrings and Business West held a thought provoking Business Breakfast consisting of a panel discussion challenging the power of the brand attended by 150 business people from across the region. Panelists Rob Law (Trunki), Nick Davies (Neighbourly.com) and Peter Haigh (Bristol Energy) spoken candidly of their experiences of how brands seduce and hold on to customers and whether being ethnical really sways consumer behaviour. Lord-Lieutentant Peaches Golding today successfully completed a course of treatment of radiotherapy for a primary breast cancer. 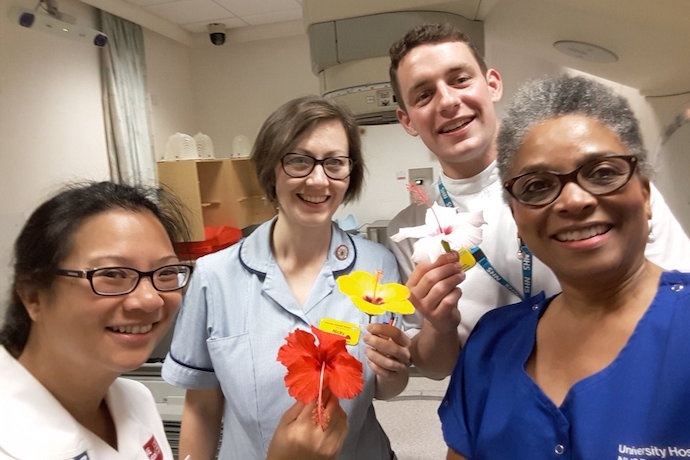 She presented each of the radiographers involved in her treatment with hibiscus flowers from a collection managed and grown by her husband, Bob. The team received a flower every day throughout her treatment. Peaches was diagnosed with breast cancer within days of being appointed Her Majesty’s Lord-Lieutenant. She had surgery as well as three weeks of radiotherapy delivered five days a week in order to cure the illness. Although she is recovering well, her stamina is reduced due to the fatigue she is experiencing as a normal part of the treatment process. The treatment received by Peaches at the Oncology Centre at United Hospitals Bristol has been of the highest quality, delivered with care and compassion. While she is feeling so fatigued, Peaches is limiting her duties as Lord-Lieutenant to some small extent. However, she is confident that she will soon return to her normal self. 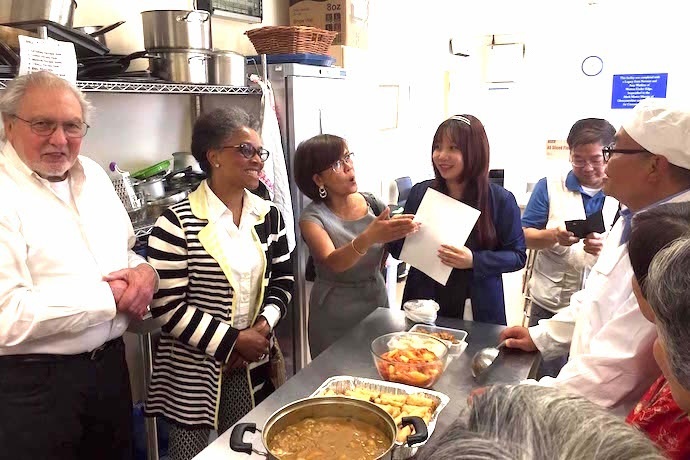 Lord-Lieutenant Peaches Golding and her husband Bob were invited to take part in the last of the international food classes organised by the Bristol & Avon Chinese Women’s Group (BACWG). The theme was "Green food". More than 60 people took part in the event. Among the guests were Lord Mayor of Bristol Councillor Mrs Lesley Alexander, Councillor Helen Holland, Adam Rees, Director of Bristol Ageing Better and Carly Urbanski, Programme Manage of, Bristol Ageing Better. Both the Lord-Lieutenant and the Lord Mayor presented certificates to the volunteer chefs that led 24 previous cookery sessions held earlier in the year. The aim of the cooking classes was to encourage Chinese residents in Bristol to learn how to cook tasty foods from countries around the world. The classes attracted professional and voluntary chefs as well as people living across the City. Rosa Hui DL is the Managing Director of BACWG. Lord-Lieutenant Peaches Golding visited the Great Western Air Ambulance Charity (GWAAC) of which she is Patron. 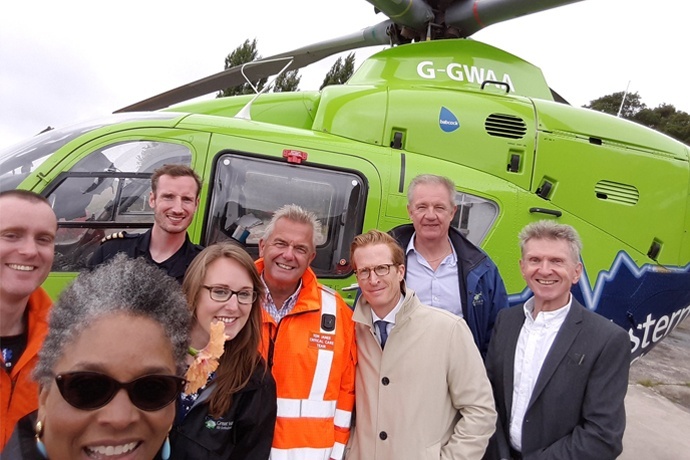 GWAAC provides life saving emergency care to prople who cannot be reached by road or are in such a critical state that they require specialist skills at the scene of an accident. 40% of GWAAC services are provided to people in Bristol. Anyone can support their operation! http://www.greatwesternairambulance.com/. It is not entirely clear what was going on when this photo was taken, but apparently Peaches came across some long forgotten little treasures in his top pocket that filled them both with instant and identical delight. SU 2017 celebrated a vast array of achievements by students at the University of Bristol. Professor George Banting and Vice Chancellor Professor Hugh Brady joined the Lord-Lieutenant, dignitaries, academics and students for an evening of entertainment, awards and presentations. The Students’ Union holds The Queen’s Award for Voluntary Service. 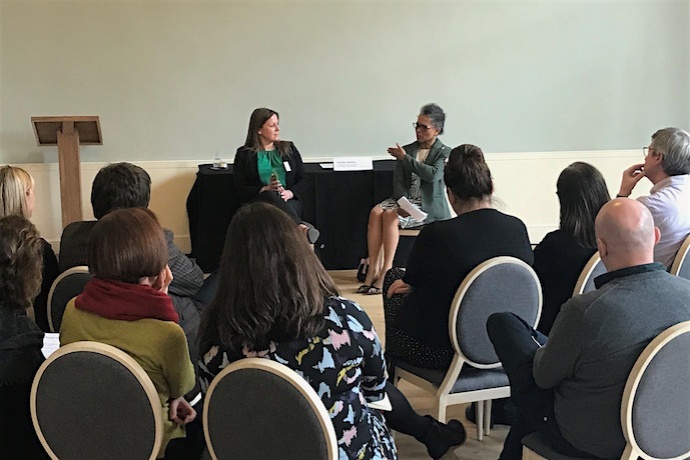 The latest group of students enrolled on the University of North Carolina (UNC) Honors Carolina course spent a lovely day in Bristol during which they engaged in a discussion with former Carolina alumna Lord-Lieutenant Peaches Golding OBE. Meeting Peaches, a graduate from the UNC Chapel Hill, USA, in 1976, was part of a packed, week-long programme of activities for the students, who are recent high school graduates about to start their four years of study at UNC. Students participating on the Honors Carolina programme met a number of Carolina alumni involved in plant genomics at Kew, diplomacy at the Foreign and Commonwealth Office, global finance at Barclays; they also attended a performance at Shakespeare’s Globe Theatre. Peaches was instrumental in encouraging the Honors Carolina programme to visit Bristol. The group was based at Winston House in Bedford Square, the London home of UNC Honors Carolina. 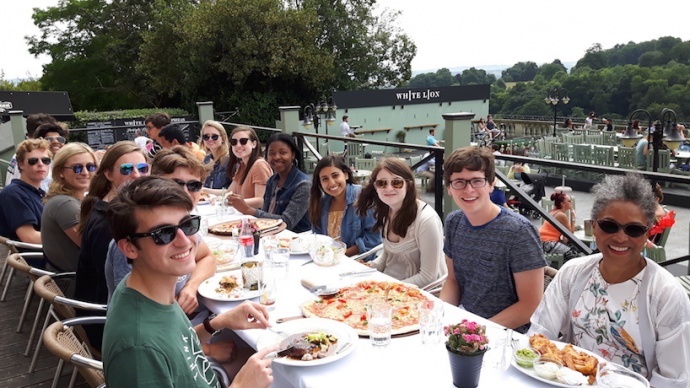 During their day-trip from the capital city they enjoyed a cruise along the Bristol docks and ate lunch overlooking the iconic Clifton Suspension Bridge. One of the aims of the Honors Carolina programme is to broaden the career ambitions and horizons of the participants. Thus, in a discussion led by Honors Carolina Dean Prof Jim Leloudis, the group held an informal, illustrated conversation on how Peaches’ career had developed and progressed from those heady days in Chapel Hill to her present role as Lord-Lieutenant of Bristol, UK.